The old CX-5 accounted for 25% of Mazda’s global sales, so the new one better be good. 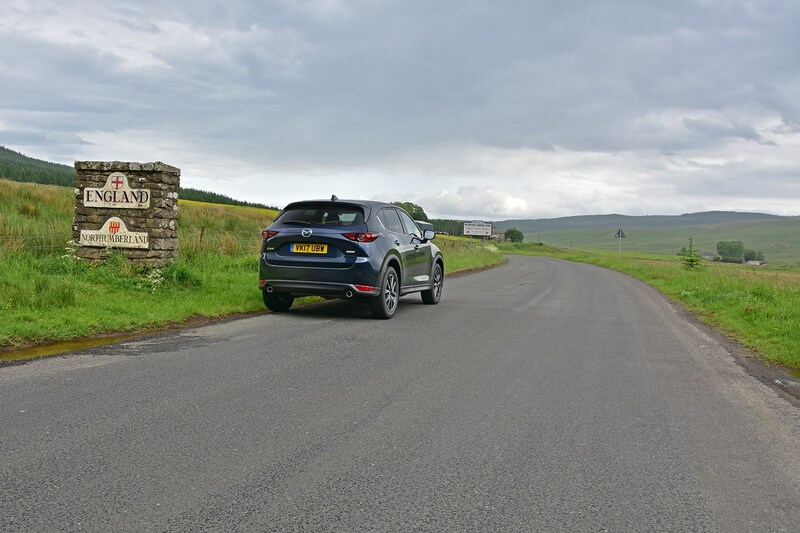 We’ve flown up to Scotland to find out, by pitting what’s expected to be the bestselling version – the 2.2d 150hp Sport Nav 2WD – against 500 miles of the toughest roads we can find. 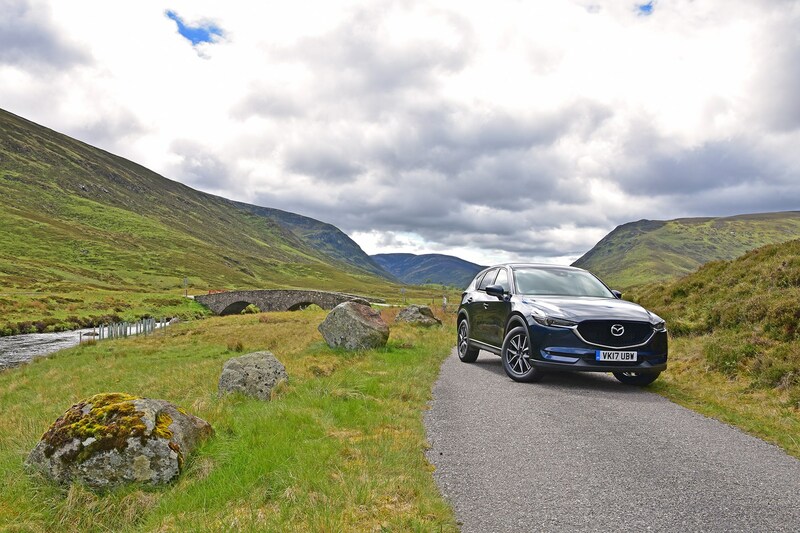 With just a day to transport us through the Cairngorms, across the Forth road bridge, around the traffic-clogged outskirts of Edinburgh and through the scenic Kielder Forest Park and North Pennines – plus hundreds of miles of dreary A1 motorway – the CX-5 has a big task ahead of it. Standard-fit sat-nav, Bluetooth, automatic lights and wipers, cruise control and a Bose sound system should make the CX-5 a relaxing long-distance machine. But how does it fare in reality and will it ferry us 500 miles on one tank of diesel? Read on to find out. 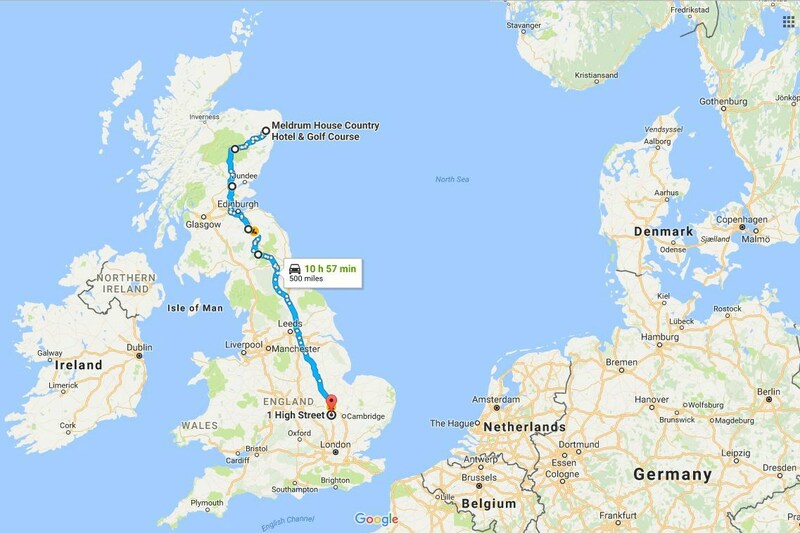 With breakfast devoured and the CX-5 brimmed with diesel, we set off from near Aberdeen towards the Cairngorms – home to five of the UK’s six highest mountains. Stuck behind a series of tractors lugging ever larger loads, the CX-5 was a relaxing place to sit for the first few miles of dawdling. Thanks to light but direct steering, a relatively firm but smooth ride and a slick gearchange, no acclimatising was needed. Despite the raised driving position – which can sometimes cut down on side and rear visibility, the CX-5 feels surprisingly small on the road, boosting confidence. 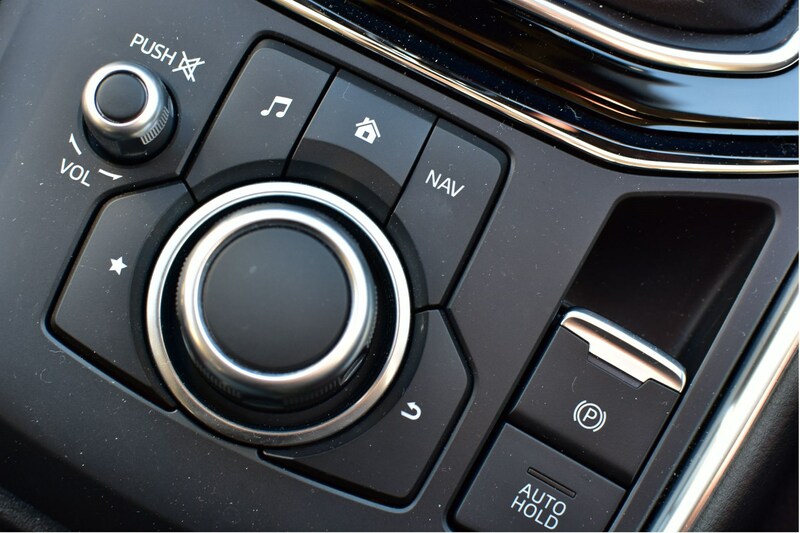 Furthermore, all the controls fall easily to hand, unlike in some jacked-up cars, where it can feel as if the driver’s seat is high in relation to the knobs and switches, making them hard to reach. As the road began to snake upwards, the tractors slowly disappeared, letting us pick up speed. With clear enough instructions from the sat-nav voice and on the screen, keeping tabs on where to go wasn’t a problem. 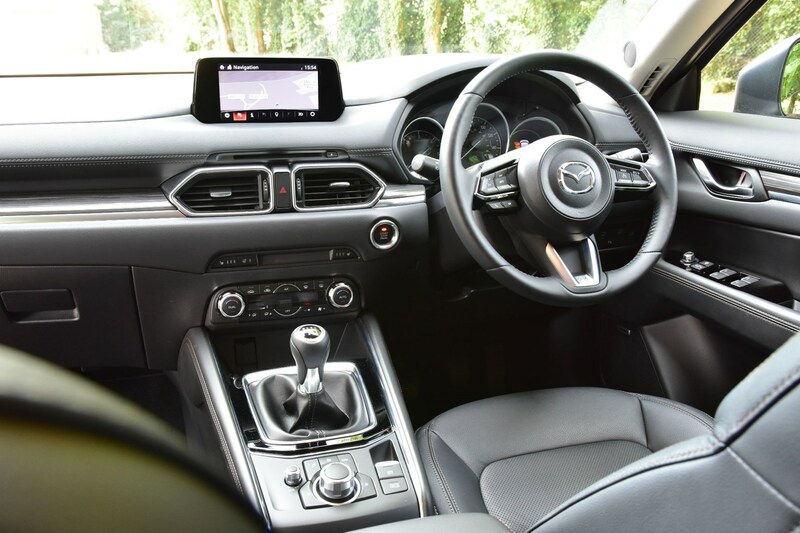 It’s good that Mazda has avoided the temptation to provide touchscreen controls for its media system when driving, as these can make the simplest of radio or sat-nav adjustments hugely distracting. The rotary dial is easy to find and use while driving, without having to divert your eyes from the road. However, we wish the system wouldn’t jump back to the top of the station list every time you change the radio, forcing you to scroll down from the top again if you want to channel hop. This is infuriating when you’re 500 miles from home and have never heard of half of the local radio stations! 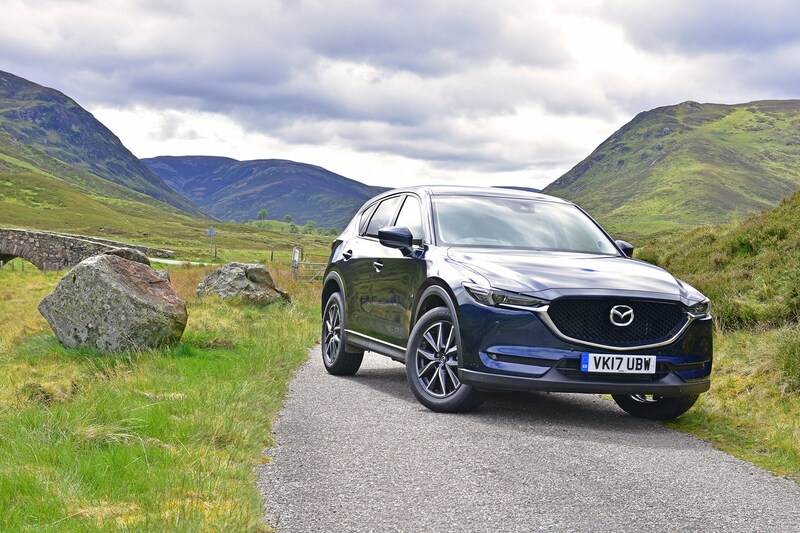 Heading further up the Cairngorms and past a series of dormant ski lifts, it quickly became evident that this Mazda is just as satisfying to drive as its predecessor. While it’s no sports car, keen drivers forced into getting a practical car by parenthood shouldn’t feel short changed with the CX-5. On the most bumpy, undulating parts of the A93 heading down from the Glenshee Ski Centre, the Mazda remained unflustered. The steering could have done with a little more weight to provide a greater sense of the front tyres’ grip, though. While diesel emissions continue to be under scrutiny, you’ll definitely want to skip the petrol option in the CX-5. With no turbocharger to boost power and low engine speed muscle, this motor feels thoroughly overwhelmed if you encounter any form of hill or need to accelerate briskly. Scottish mountain roads may be steep, but the petrol version we tried the previous day required full throttle and a huge amount of gear-changing simply to maintain 50mph or so on these. We even found ourselves in third and, worse still, second gear with the engine screaming away several times during our test. Thankfully, even the less powerful diesel – with 150hp – had no such issues. It provided a hefty amount of shove from far lower engine speeds than Volkswagen, Kia and Volvo alternatives could muster. More than this, it performed very strongly at high engine speeds, proving smoother and faster when worked hard than nearly all rivals. 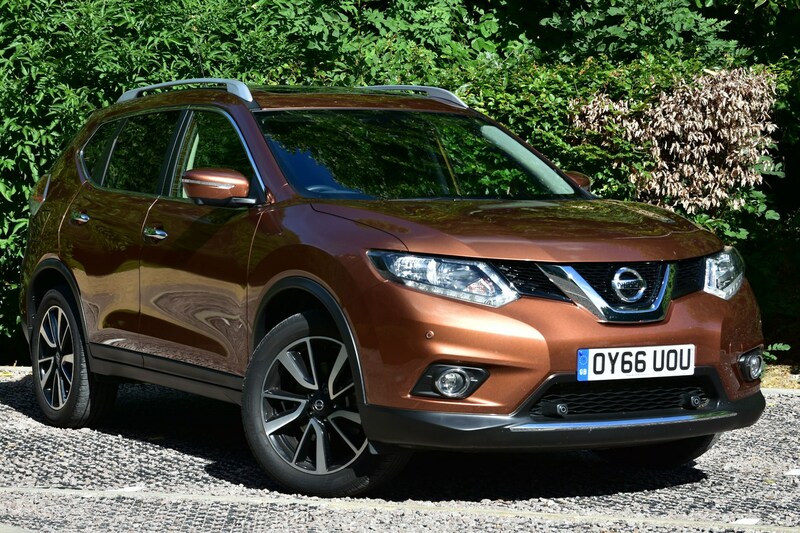 You probably won’t mistake it for a petrol, but the 2.2-litre diesel is infinitely more refined and punchy than even the 177hp diesel Nissan X-Trail. Despite several hours behind the wheel and the fact our CX-5 has a manual gearbox, the first few hours of our 500-mile trip were surprisingly comfortable. With little noise from the engine, and not much in the way of wind or road noise, the miles were flying by. Crossing the Forth road bridge provided a dramatic change of scene. Skirting the Scottish capital saw heavy traffic and stop-start progress. The light clutch and steering meant this wasn’t too taxing and before long we turned onto the A7 which plunges through the Scottish countryside. Continuing south onto smaller and smaller roads the CX-5 hit the English border at 5:44pm – nearly eight hours after setting off, but still nowhere near halfway through the journey distance-wise. Thankfully, just as the average speed was low, fuel use was low, too. The trip computer was hovering not too far below the 50mpg mark – a little adrift of the 56.5mpg claimed, but not bad considering the huge hills summited and traffic encountered near Edinburgh. Skirting the scenic shores of Kielder Water, the route cut cross country past Newcastle, clipping the east side of the Pennines. With light starting to fade we pointed the CX-5 onto the A1 at Scotch Corner and readied ourselves for several hours of slogging south. With around 200 miles of A1 to pass and having exhausted all three radio stations within range, we tried out the CX-5’s Bluetooth phone connectivity to break up the monotony. Simple to set up and clear in sound quality, this was a big tick for the Mazda. With dedicated steering wheel-mounted phone controls and a straightforward onscreen menu, making and receiving calls is a much less distracting process than with some rivals. The CX-5 cruised dutifully along the A1 for the final three hours of our trip. The only drama came from it predicting that we wouldn’t make it to St Neots, Cambridgeshire, without running out of fuel. This despite theoretically being capable of 697 miles per tank - far more than we were asking of it. Cruising gently along the A1 saw that range figure increase, eventually leaving us with 31 miles spare when we arrived in St Neots 13 hours and 8 minutes after setting off. Though we’d driven the final four hours straight without stopping, the CX-5 had remained remarkably comfortable considering. Disappointing, however, was the fuel economy. It may have displayed a consumption figure of 50.9mpg on the trip computer, but our 500-mile trip worked out at a less impressive 47.1mpg in reality. That’s still reasonable, but a significant difference from the displayed figure. Our CX-5 – a 2.2d 150hp Sport Nav model with one option, metallic paint – made a pretty good impression on its first outing with us. In Sport Nav trim we couldn’t have wanted for any more kit – in fact all we could have asked for was cold weather to test out the heated seats and steering wheel. Acceleration and refinement from the diesel engine are also good. Over the next six months, however, we’ll be seeing how this £29,255 model stacks up against rivals to establish whether it’s the medium SUV to go for. The Mazda CX-5 might be overshadowed by big-selling Ford Kuga and Kia Sportage rivals in the minds of many crossover buyers, but could it be the smart choice? That’s what we’re hoping to find out over the next six months. We’ve gone for the model which is expected to top CX-5 sales – the 2.2d 150hp 2WD Sport Nav. This CX-5 would also be our choice if it were our money. That’s because the entry-level diesel offers greater performance than the sole petrol version and is £2,700 cheaper than the all-wheel-drive-only 175hp diesel alternative. And it’s got all the standard kit you could want. You might have to pay a little more for this diesel over the 165hp petrol, but this is money well spent, as the 150hp diesel offers much greater real-world punch than the turbo-free 2.0-litre petrol, which has to be worked when accelerating or trying to maintain speed uphill. Despite being the least powerful CX-5, our 150hp model is barely any slower than the range-topping 175hp diesel – taking a reasonable 9.4 seconds to accelerate to 62mph – as it does without the latter’s heavy, acceleration-hindering all-wheel drive. Better still, the diesel engine and two-wheel drive combination mean that this is the most economical CX-5 on paper, returning claimed economy of 56.5mpg – ahead of the 175hp model’s 52.3mpg and the petrol’s 44.1mpg claim. Two trim levels are available on the CX-5; SE-L Nav and Sport Nav. All models have a decent array of equipment fitted as standard, though stepping up to Sport Nav adds a significant amount of extra high-end kit. Our test car is completely standard apart from the addition of Deep Crystal Blue metallic paint for an additional £560. That takes the cash price from £28,695 to £29,255; not much considering how much equipment is thrown in. We’d be tempted to choose another colour, however, as this murky blue isn’t the most flattering shade on a mid-size off-roader. As you get so much kit as standard, though, we’d also consider saving ourselves £3,000 by going for SE-L Nav trim. While the reversing camera is a nice to have, we’ll be considering over the next six months whether we’d pay extra for the other Sport Nav toys. 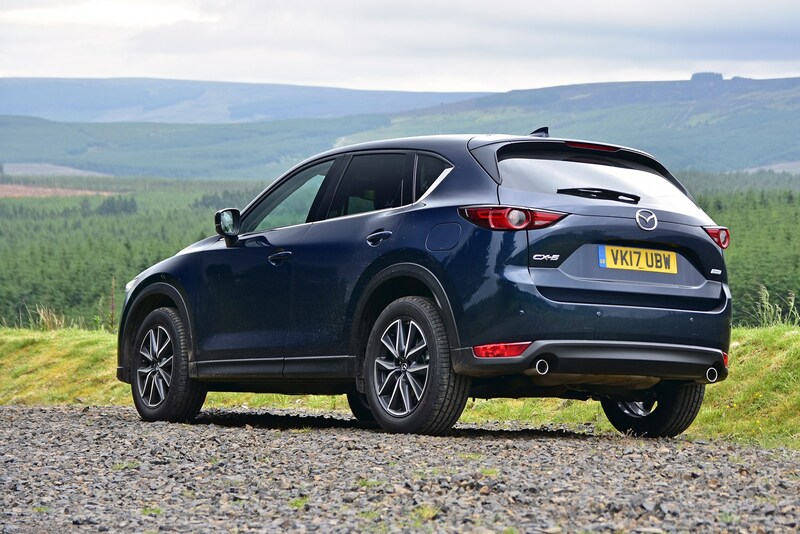 Stay tuned for our next update, when we’ll be assessing how the CX-5 stacks up on Mazda’s PCP finance scheme – you might be surprised what you can get for the same monthly payment. We’ll also be keeping tabs on the CX-5’s fuel economy. It’s currently ticking along at 47.0mpg – a pretty strong figure considering how few miles the car has covered. The Mazda CX-5 has competitive list prices, but don’t think that these have much relation to how much you’ll have to pay each month for PCP finance. With no deposit contribution discount and high 5.9% APR, you’ll have to dig deep to put a CX-5 on the drive. While our CX-5 2.2d 150hp Sport Nav with metallic paint in cash terms is around £2,500 more than some rivals – such as the closest Kia Sportage – it’s still nearly £4,000 less than an equivalent VW Tiguan and over £5,400 less than the most similar Land Rover Discovery Sport. Look at finance costs, however, and it’s a different picture. You’ll have to pay a hefty £449 per month on a three-year, 9,000-mile-per-year contract (with a £4,229 deposit). 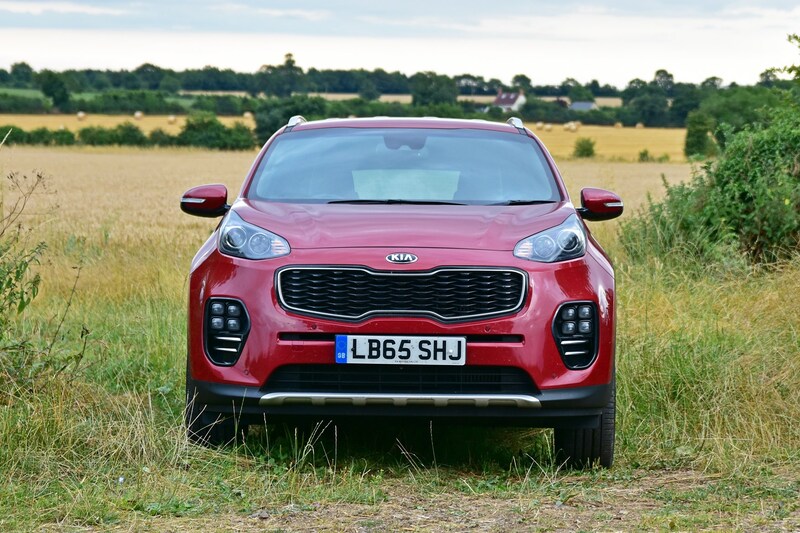 That compares with just £355 for the Kia Sportage 2.0 CRDi AWD GT-Line, despite this car also having all-wheel drive as standard (identical finance terms). Even the plusher high-spec Sportage 2.0 CRDI AWD KX-4 will cost you less at £434 per month. Don’t think the Sportage is the only SUV that undercuts our CX-5; the Ford Kuga 2.0 TDCI 150 Titanium X is just £360 per month, currently benefitting from a £2,000 discount and interest-free credit. 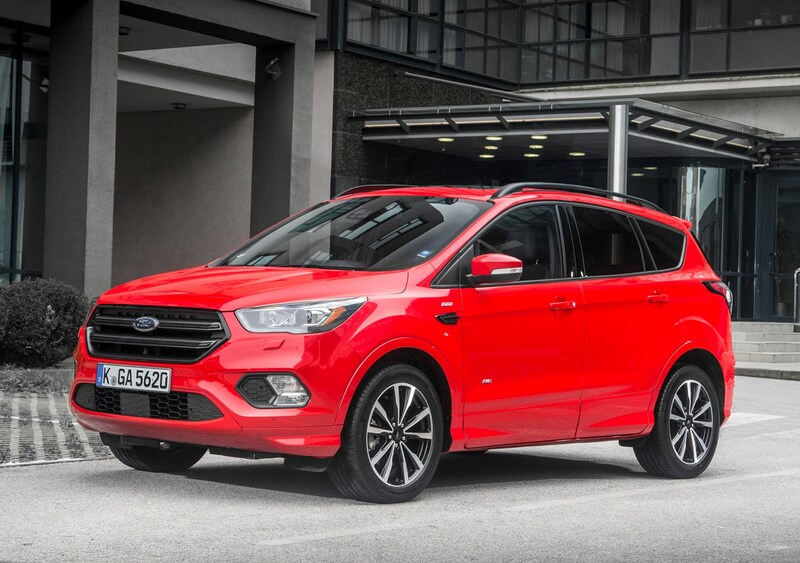 Go for the GT-Line Sportage or the Ford and you’ll save yourself more than £3,000 over three years if you run the car and then hand it back at the end of the contract. Even if you can afford the Mazda, think about all the options you could add to the Kia or Ford for the same monthly payment. Another striking mid-size off-roader is the Peugeot 3008. There’s only £250 difference in the list prices – the Peugeot being the cheaper – but you can save £48 per month with the 3008. That weighs in at £1,724 in savings over three years. Even if you plan to make the optional final payment to buy your car when the contract ends, the CX-5 is a pricey prospect at £32,865 overall – including £3,370 worth of interest. In comparison, you’d be more than £4,300 better off with the Kia, £4,500 with the Ford. That figure is £625 for the Peugeot. If you want the most SUV for your money, though, the Skoda Kodiaq is hard to beat. 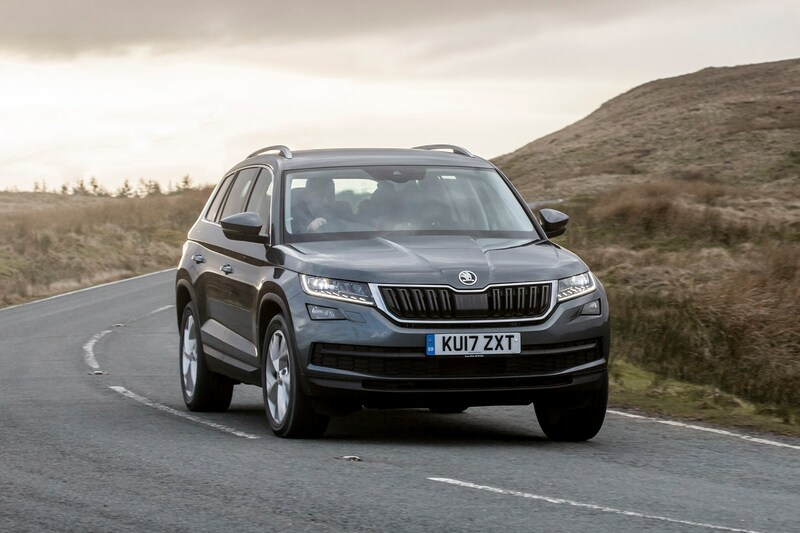 Even in range-topping Edition trim, with seven usable seats and an automatic gearbox, the Kodiaq will leave you with an extra £44 in your pocket each month. Better still, Skoda is currently offering a further £1,000 off for cars ordered before the end of September. All together, that makes the Kodiaq £3,000 cheaper over three years. As a result, this is the car the CX-5 has to beat. On paper, that makes the Kodiaq a much more sensible proposition, but we will see how they fare when we put the two head-to-head in the near future. If none of those badges do it for you, it’s also cheaper to opt for the VW Tiguan 2.0 TDI 150 2WD R-Line than the Mazda. 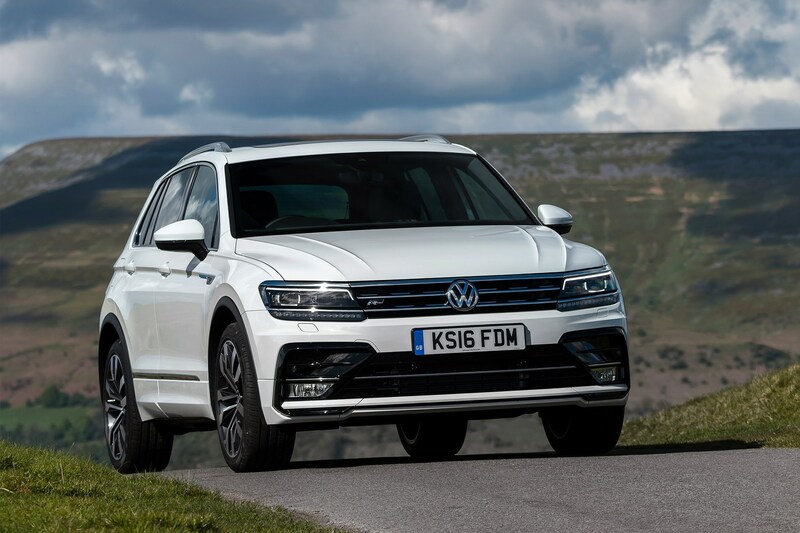 With supersized 20-inch alloy wheels, bold body styling and a plush cabin, the Tiguan feels like a more substantial machine and it’ll save you £8 per month, at £441. The Tiguan will cost you several thousand pounds more, though, if you plan to buy it at the end of the contract. As for the Land Rover Discovery Sport eD4 150hp HSE, that’ll set you back just £16 per month more, even though it has a £5,440 higher list price. That doesn’t seem bad value, considering the Land Rover’s interior feels more luxurious and it offers off-road credentials that our Mazda doesn’t have. 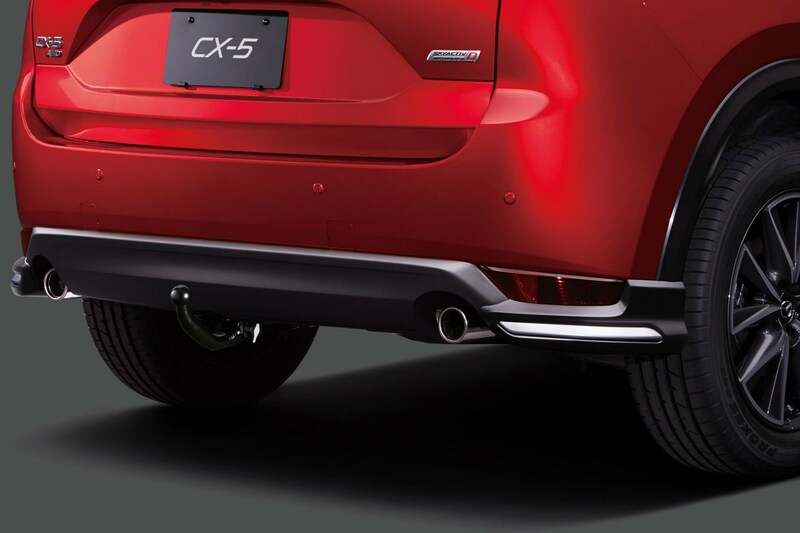 This is all the more obvious when you clock the CX-5’s low-slung undertray that hangs below the door line. It’s not just other SUVs that the CX-5 has to beat, there’s the Mazda 6 Tourer 2.2d 150hp Sport Nav, which shares the same engine. That’s not all the 6 Tourer shares; the boot is exactly the same size as the CX-5 with the seats up and larger with them folded. It also returns 8mpg more, is faster and a whopping £92 per month cheaper. The biggest difference, however, comes if you plan to make the optional final payment to buy the car at the end of the contract. That’s because the 6 Tourer works out an enormous £6,910 less than the CX-5. 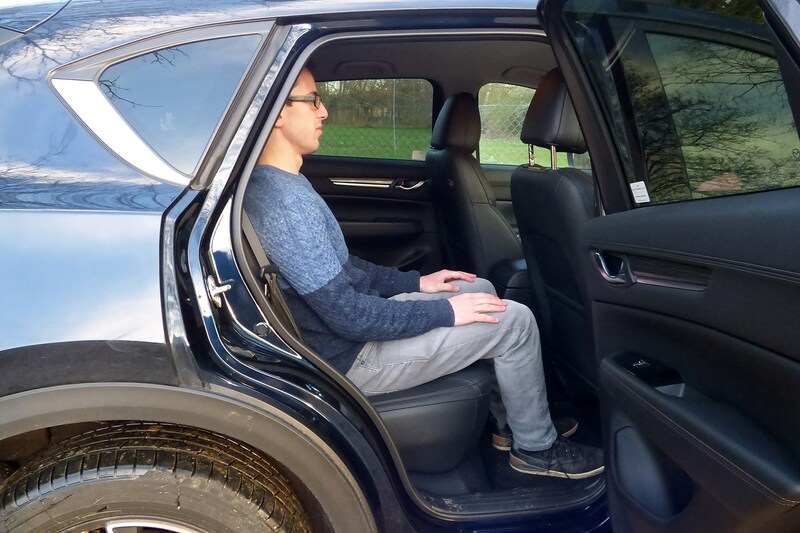 Yes, many people value the higher driving position that SUVs offer, but would you pay an additional £92 every month simply for the privilege of sitting higher? 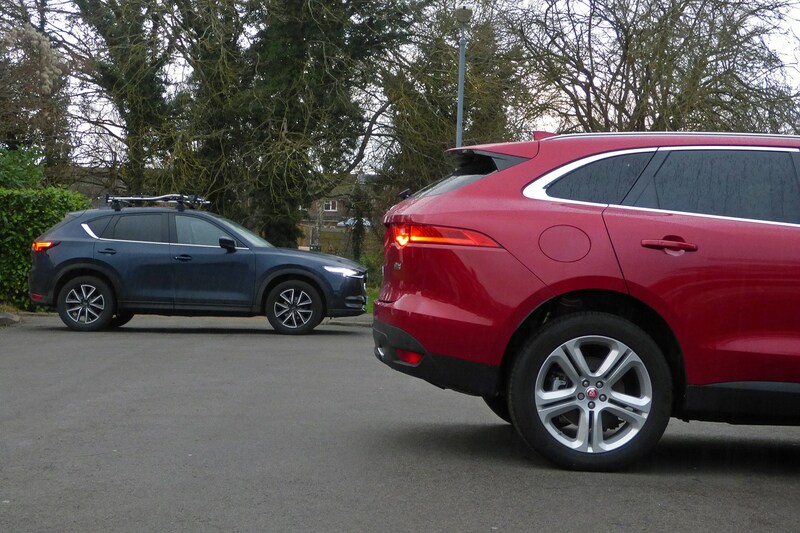 Over the coming months we’ll see how the CX-5 compares with these alternatives. Head into any supermarket car park and you’ll realise just how many off-roaders Brits are driving. Despite most motorists never leaving tarmac behind, the prospect of a high-riding, boxy 4x4 seems to be irresistible for many. But are these suitable for modern roads? We found the CX-5 a comfortable companion on a 500-mile jaunt down from Scotland to Cambridgeshire when we picked up the keys, so comfort is one of its plus points. The driving position also works well, as you’re high enough to have a good view of the road ahead, but low enough to be able to reach all the dashboard controls easily. Despite its SUV stance, we’re perplexed by the fact that the CX-5’s undertray hangs down a little below the door line, reducing its ground clearance and making it look as if it’s come loose at the best of times. So it was only half a surprise recently, when this undertray did come loose and started dragging along the road. We still can’t work out what triggered this, but we did splash through a particularly big puddle earlier on in the trip - though as the undertray had torn, sheared off a retaining bolt and come loose at one end, even this doesn’t seem like much of an explanation. Hearing a scuffing sound as we drove along a dual carriageway, we stopped to inspect what was going on. 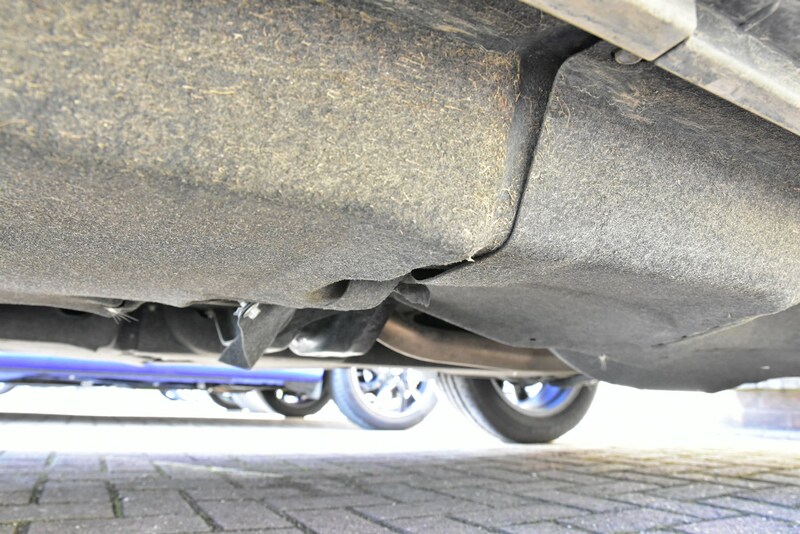 Finding one of the layers of the undertray rubbing on the tarmac and a bolt tapping against the bottom of the car, we folded everything back into place as best we could and returned to the road again – albeit at a lower speed. Inspecting the undertray at the end of the journey, we were surprised to note the material – halfway between fabric and cardboard in texture – which we wouldn’t expect to find anywhere exposed to the elements. Despite that, this material covers most of the underside of the car and is quite exposed. Back at the office the next day, we phoned Donald’s Mazda Peterborough to work out our options. We dropped off the car for inspection the next day. Once jacked up on the ramps, it was clear that two undertrays were damaged and needed to be replaced, the garage claimed. Though these look like nothing more than cheap, disposable items, the bill for replacing them was quoted at £263.93 – a lot considering they don’t seem sturdy enough to live under a car. Telling the garage to go ahead with the work, we were told that it would be several days until the parts arrived. Presumably this isn’t – as of yet – a widespread issue for new CX-5 owners. Interestingly, the bill ended up to coming to a slightly more palatable £246.95, though a whopping £193 of this was simply for the parts. Now the new parts have been fitted we’ve inspected the positioning of the new undertrays; it looks like one overlaps the other under the car. Interestingly, there is a gap between the sheets, which we imagine makes these susceptible to damage. With the prospect of being splashed and hit by road debris – or even by rocks should you take this off-roader off road – we still can’t fathom out why something sturdier isn’t fitted. In all other departments, there’s not much to report and no real signs of any other wear and tear. The engine remains punchy and refined for a diesel, the ride reasonably comfortable and the boot and rear seat space very good. Fuel economy is still in freefall, though, reaching a new low of 43.4mpg, after a particularly inefficient – 38.5mpg – tank at the hands of our enthusiastic CAR colleagues. We imagine twisty Welsh roads may be to blame for this drop. Even so, a 43.4mpg average isn’t too bad for a large, heavy off-roader. Measuring in at 4.55m long, the Mazda CX-5 competes against models such as the Ford Kuga, Kia Sportage and Nissan X-Trail. That means it’s practically the same length as a VW Golf Estate – and they share the same boot size with the rear seats folded. It’s a different matter if you need to use the rear seats, however. While the Golf Estate provides 605 litres for suitcases, antiques, dogs or whatever else you need to transport, the CX-5 can muster just 506 litres. So is the CX-5 usable enough for the typical tasks you’re likely to ask of it? With a house move on the cards, I grabbed the Mazda’s keys to find out. 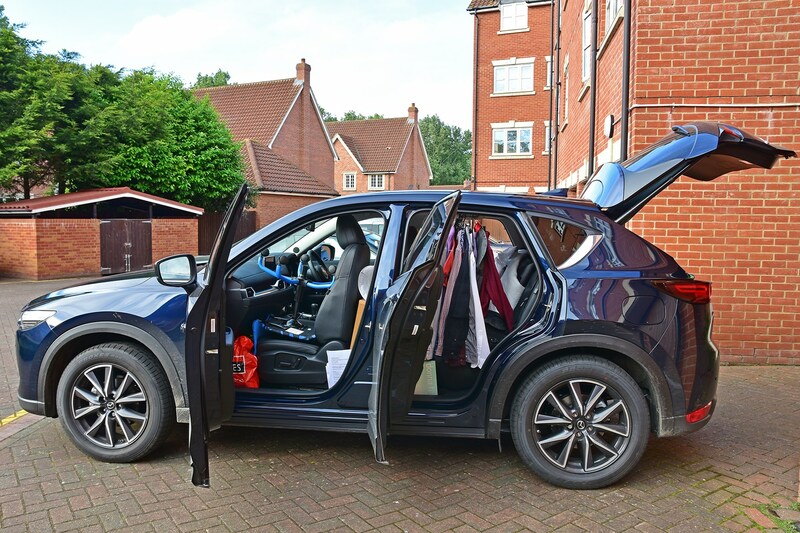 With clothes, boxes, books and small bits of furniture to haul, I was keen to see just how much could be coaxed into the CX-5’s squared-off tail. The first thing that strikes you when loading up this Mazda is just how wide the back doors open. 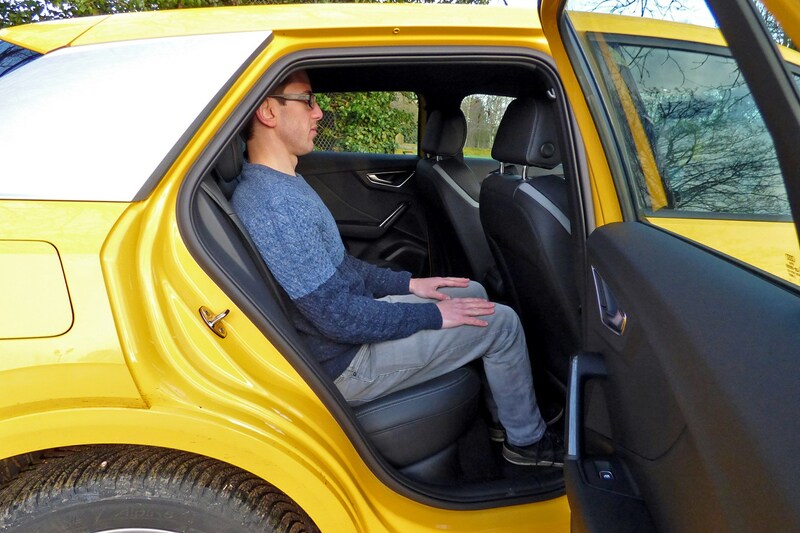 This may sound like a small point, but it makes getting yourself in and out very easy, while making it possible to fit a not insubstantial bedside table into the rear passenger side footwell. 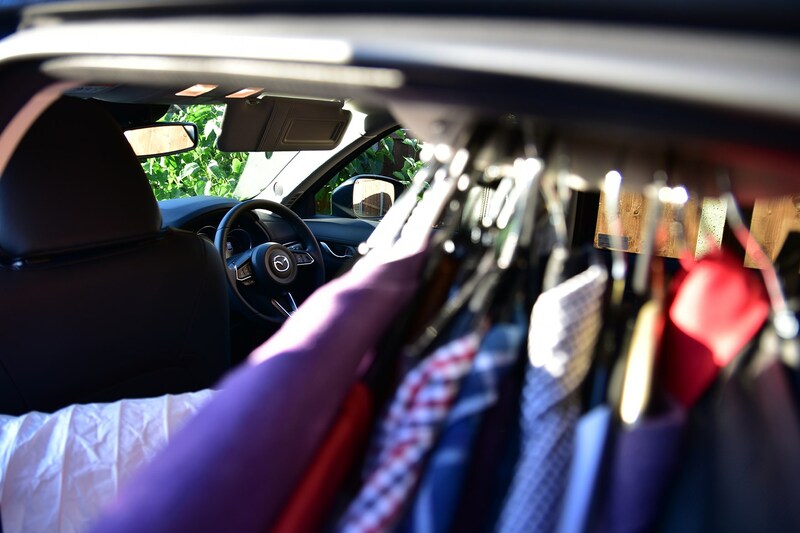 This easy access also aided with hanging up half-a-wardrobe’s worth of clothes in the back and adding in several duvets, an uplighter, a desk chair and several boxes – all without breaking into the boot. The CX-5’s closest rivals, the Ford Kuga and Kia Sportage aren’t too much competition when it comes to boot size; the Kuga essentially matches the CX-5 with the rear seats folded and the Sportage is similarly practical with the rear seats up. Neither can match the CX-5 on both counts, though. Look at the Nissan X-Trail, Skoda Kodiaq and VW Tiguan, however, and the Mazda is way down on space, whichever way you configure the boot. Despite the numbers, this is still a very practical car. Unless you’re lugging the tallest of grandfather clocks or need to fit in dozens of awkwardly sized boxes, you shouldn’t have any issues here. 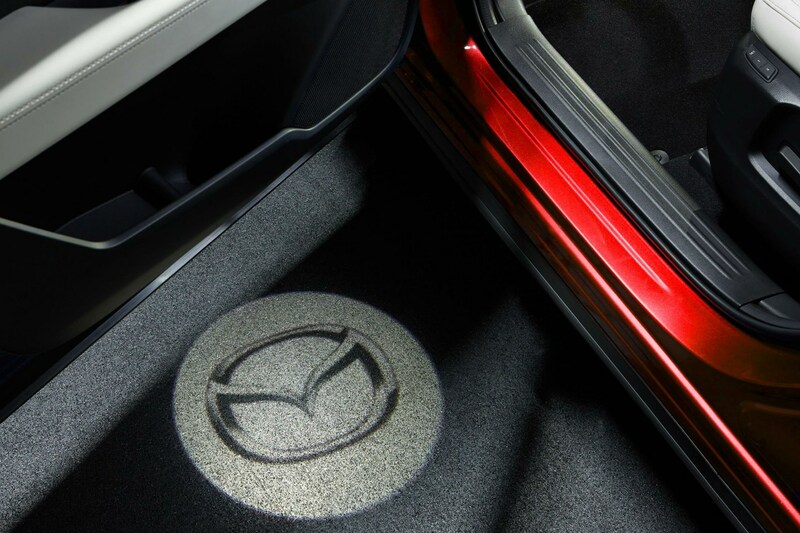 What makes the Mazda’s boot particularly useful, is that it’s tall enough to fit high items such as a wooden clothes basket below the boot cover. 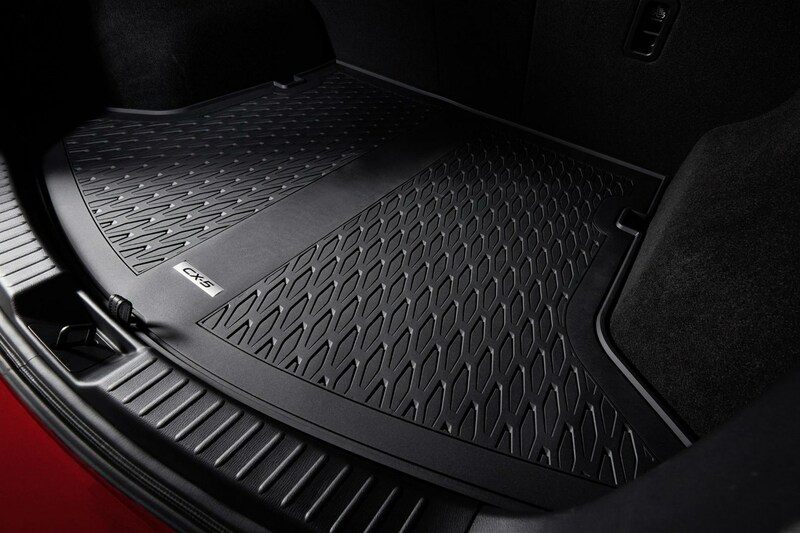 The flexible cover moves up with the hatchback, so it’s out of the way when you’re loading and it doesn’t get knocked out of place when you shut the hatch. This is much more user friendly than the stiff boot covers with some other models or those that fire out of place when knocked, grazing knuckles in the process. As a result, we managed to make full use of the space under the boot cover, with no precarious piles of luggage needed to fit everything in. 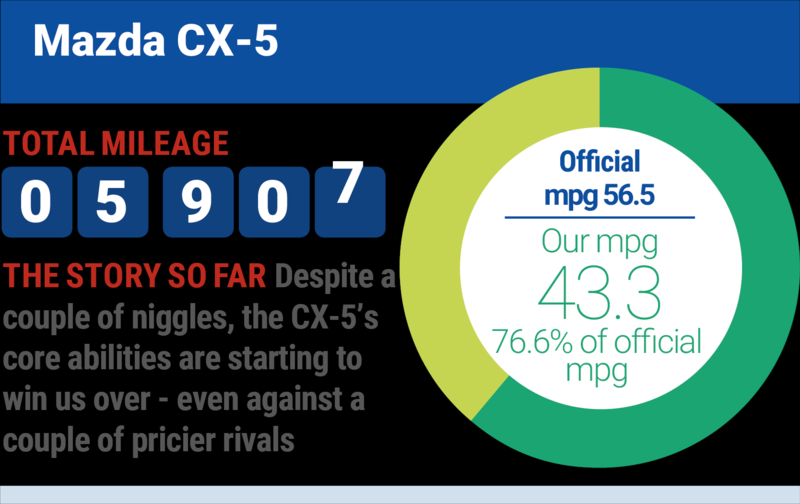 Mazda has a good reputation for producing cars that often return fuel economy close to their official figures, however, the CX-5 is still falling far short of its claimed 56.5mpg. Our latest reading of 42.8mpg is around 25% shy of that claim. Considering our first tank came in at 47.1mpg, we’re still hoping to improve upon this in future fills. 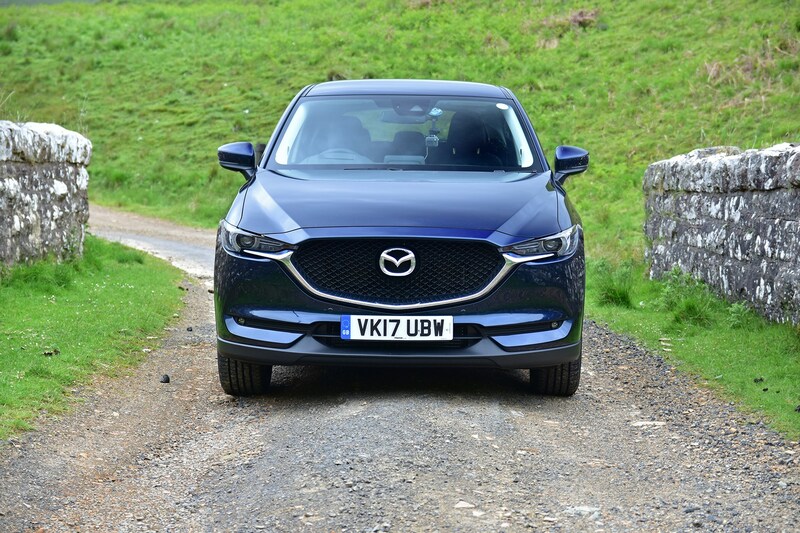 We criticised our CX-5 a few months back for its high PCP finance costs compared with numerous rivals, but following our critique, Mazda has slashed its off-roader’s monthly payments. Our CX-5 2.2d 150hp Sport Nav – which would have set you back £449 per month when we picked up the car (on a three-year, 9,000-mile-per-year contract with a £4,229 deposit) – has tumbled to less than £415. That saves you more than £1,200 over a typical three-year contract. Explaining the lower costs are a new £500 deposit contribution discount and lower 3.9% APR charges – down from 5.9%. Together these mean you pay far less interest, more than off-setting residual values which have also fallen – a move that would typically lead to higher monthly costs. These changes mean that while the CX-5 was around £85 per month more than Kia Sportage and Ford Kuga equivalents, it now averages out at around £50 more. 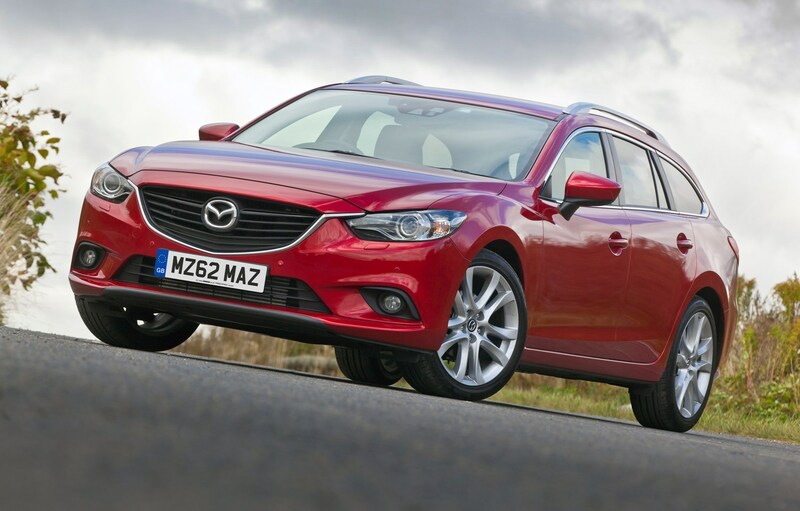 Bear in mind the Mazda’s refined, punchy engine, striking looks and rarity factor and it could justify that extra cost for many drivers. Meanwhile, a top-spec Skoda Kodiaq – with the benefit of an automatic gearbox and seven seats as standard – has gone from being £44 less than the CX-5 to just £11 less. Yes, the Kodiaq is still the sensible choice, but it’s now much easier to justify going for the Mazda if the Skoda doesn’t appeal. Those considering the Peugeot 3008 alternative will also want to think seriously about the CX-5; while it was £48 per month more than the French car, the Peugeot is now £1 per month more. Similarly, the equivalent Volkswagen Tiguan, which initially undercut the Mazda, would now set you back an additional £19 each month. Another close rival for the CX-5 that we got our hands on recently, is the Nissan X-Trail. Despite feeling much more low-rent inside than the Mazda, the Nissan is a far pricier car. 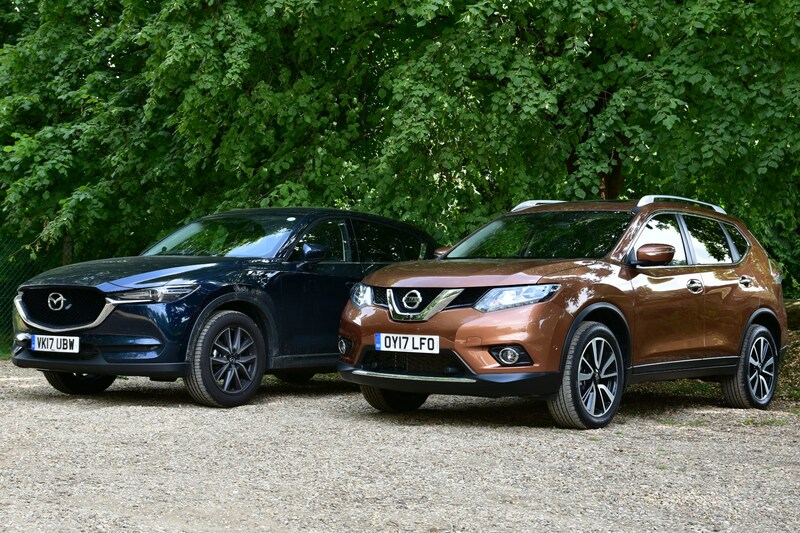 Go for the X-Trail 2.0 dCi 177hp Tekna – which only just matches the Mazda for performance, despite offering more power – and you’ll have to stump up a whopping £35,960 compared with £28,695 for the CX-5. Yes, the Nissan includes all-wheel drive as standard – though this will offer little tangible benefit to most drivers – but even so it is extraordinarily expensive. Especially as the Mazda looks more striking inside and out and feels like a more substantial machine. 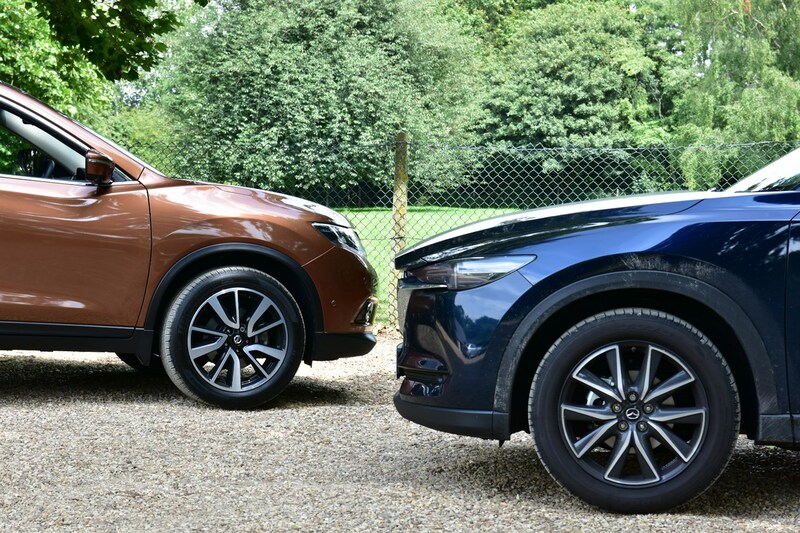 Though you can find huge discounts of more than £8,000 for this model online, we’re still not sure the X-Trail is worth around £28,000; the Mazda is by far the more rounded car for the money – even before discounts. Worse still, the Nissan’s engine is coarse and doesn’t feel that powerful, forcing you to change gear regularly to exploit its very narrow powerband. The CX-5’s motor makes the Mazda feel like a magic carpet in comparison, with significantly greater refinement and strong pull from much lower in the rev range; far more fitting for a family car. Even if you go for the cheaper 1.6-litre diesel Nissan – which offers much less muscle for dealing with a full complement of passengers or a heavy load – you’ll be more than £4,000 out of pocket. It’s no different on the finance front, with the X-Trail 1.6 dCi 130 Tekna working out at £35 per month more than the Mazda. As a result, we can think of absolutely no reason to go for the Nissan. The Mazda is also the more satisfying car around bends and provides a slicker gearchange and smoother ride – meaning it’s the better choice for both driver and passengers. Another area it outclasses the Nissan is in visibility terms; no, the CX-5 isn’t the easiest car to see out of, but it’s far easier to manoeuvre than the X-Trail, which has huge rear pillars. Yes, we’re yet to be blown away by the CX-5, but comparing it with the X-Trail really does highlight how many things it is good at. Five months with the CX-5 and we continue to be impressed with the punchy, smooth diesel engine but we’re also starting to notice several frustrating details about the car. 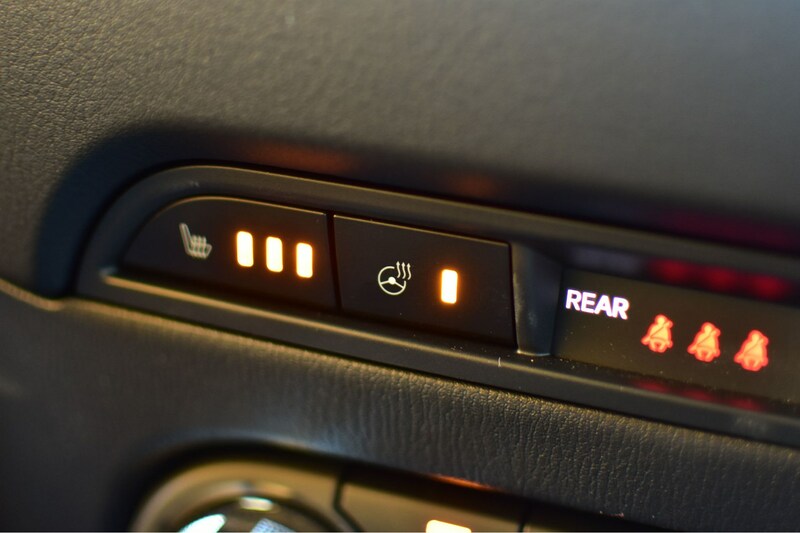 With the temperatures plummeting as November approaches, the heated steering wheel and front seats are coming in for regular use. While the Mazda’s derriere defrosters do a very effective job, the heated steering wheel is less pleasing to the palms. Unlike the tush toasting thrones, the steering wheel merely licks the fingers with an uneven spread of warmth. Heat builds only above and below the main steering wheel spokes but even then this seems to alternate between hot and merely lukewarm. At times the wheel even switches itself off completely, whether your hands are completely thawed or not. Considering the engine takes a while to warm up enough to blow hot air into the car, gloves may still be a better option for those susceptible to frosty fingers. Another infuriating aspect we’re yet to acclimatise to is the car’s auto lock function. Thanks to the keyless entry and start meaning that you never have to take the key out of your pocket – a handy feature – we’re hesitant to switch this off. However, its oversensitive calibration means that by the time you’ve walked around the front of the car to grab a bag from the passenger footwell, the CX-5 has locked itself. 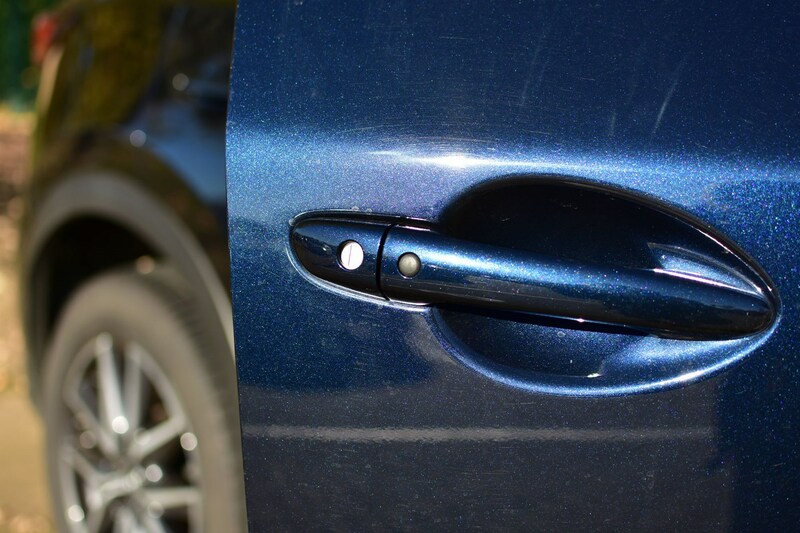 Thankfully, door handle-mounted buttons mean you can unlock the car again without having to fish the key out, but even so, if would seem better if the car would let you at least walk a few metres away before locking. Another peeve of ours is tuning the radio. 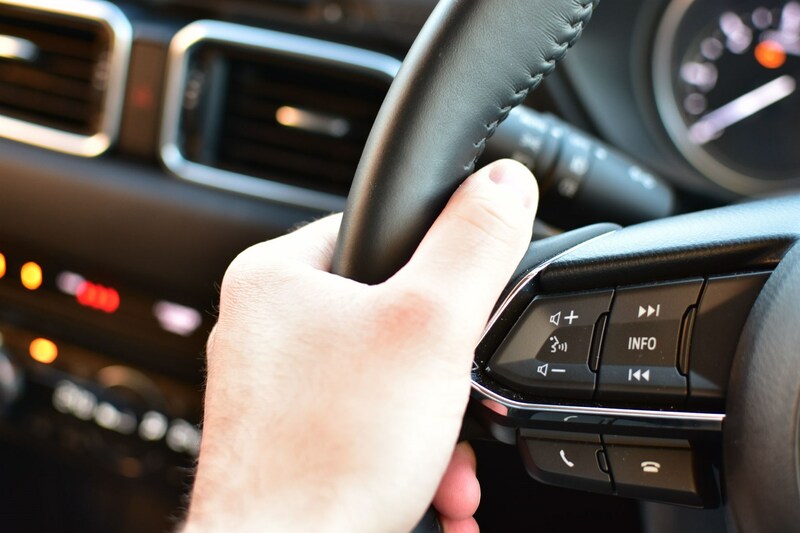 Yes, there are steering wheel-mounted buttons for skipping between channels, but without any media information being displayed alongside the speedometer – as in a number of rivals – you often find yourself clicking dozens of times going through different frequencies for the same radio station. Revert to scrolling through specific stations on the media system, however, and as soon as you select a station it sends you back up to the top of the list. If you’re channel hopping to find music or news, for instance, this quickly becomes infuriating and seems completely unnecessary, when many rivals remain on the selected station. Overall the media system is pleasingly simple to use, making it easy to enter addresses into the sat-nav. Even here, though, there are a number of unnecessary quirks. The system doesn’t recognise all postcodes, sometimes entering its own approximation of what you’re searching for. Select an address and it starts a countdown before loading the directions. Why it can’t just move straight into showing you the route without forcing you to click again or waiting for it to get its act together, we have no idea. 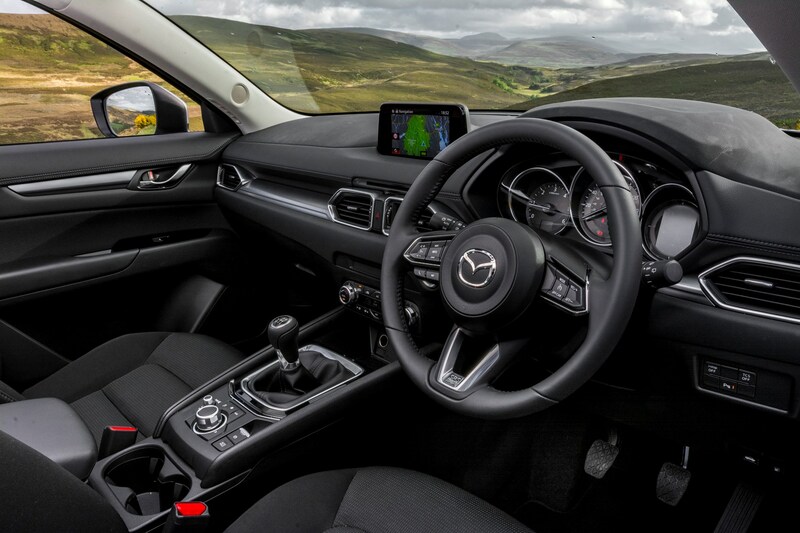 Mazda gets many Brownie points for using a rotary control for its media system as it’s still far easier – and less distracting – to use on the move than touchscreen competitor systems that force you to jab away at the screen. The head-up display also means that you can monitor your speed without taking your eyes from the road. It’s clear and easy to read, whatever the outside conditions, though we find it frustrating that the speed on the display is several mph out from what is on the speedometer, leaving us unsure which one to believe. 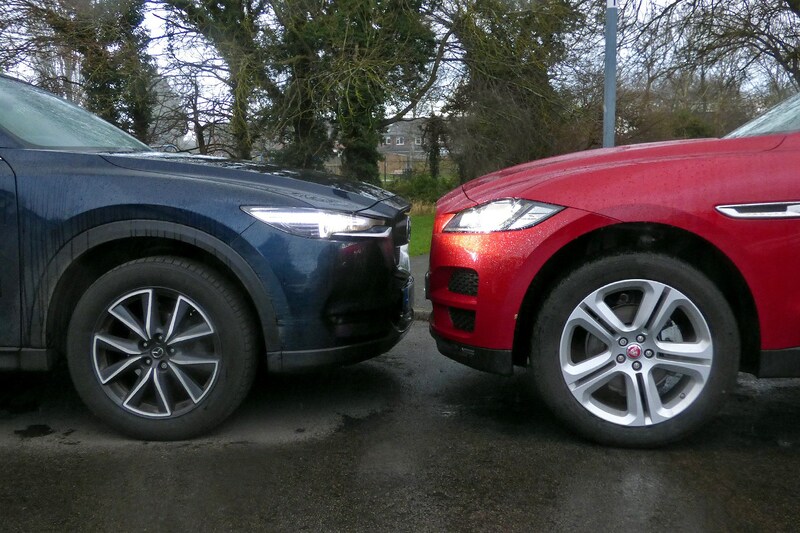 Update 8: good value CX-5 or upmarket Volvo XC60? Our Mazda has seen off the massively expensive and hugely underwhelming Nissan X-Trail in a previous update, but how does it fare against the more upmarket – and pricier – Volvo XC60? Like the CX-5, this Volvo is not the most obvious medium SUV to go for. But it could be one of the smart choices. That’s because it offers a plush, stylish cabin and a striking exterior that set it apart from rivals. The XC60 is by far the pricier model in D4 R Design AWD form – weighing in at £530 per month on PCP finance or £40,355 outright compared with £391 per month and £28,695 for our CX-5 – albeit equipped with all-wheel drive and an automatic gearbox. Ditch the automatic gearbox and that price tumbles, but the Volvo is still the premium option. So does it warrant the higher cost? Clamber into the cabin and the XC60 immediately feels a few rungs above the CX-5. Not only is the design much more eye-catching, with a large portrait screen for the touchscreen media system, but the quality of materials feels far higher. The CX-5 looks good at a distance, but the doors, dashboard and seats, to name a few, all feel far less solid and plush than the Volvo. These might sound like trivial points, but there’s something far more relaxing about spending time in the Swedish car than our long-termer. Everything from the media system to the speakers exudes quality. That media system is extremely distracting to use while driving, however. While it looks good, it doesn’t feel like it’s been designed to be used in a car and there are no physical controls to use instead. It’s illegal to use a tablet while driving for a reason and we wonder how wise it is fitting such a tablet-like system to a car. 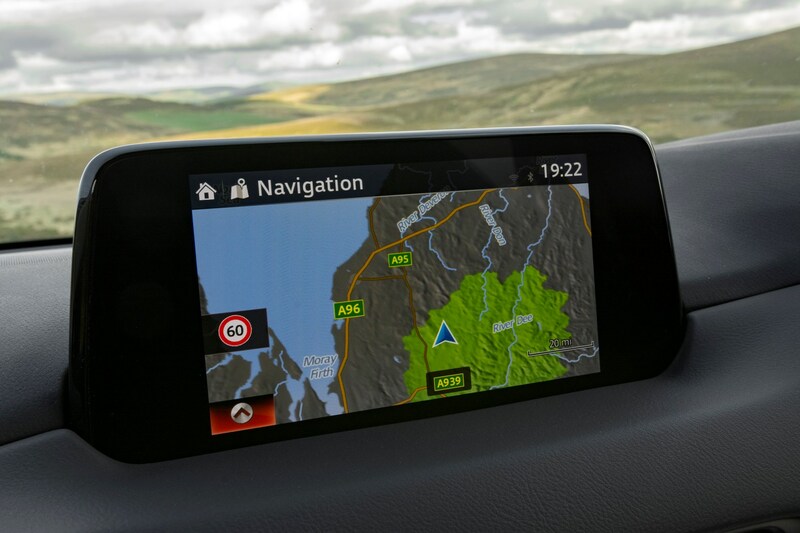 Onscreen buttons can be small, as is some of the text and even the sat-nav display is not as clear as it should be considering the sheer size of the screen. Bear in mind how comfort-oriented and nicely designed the interior is and this detracts from the entire appeal of the car. Volvo may be famed for making safe cars, but it doesn’t matter how protective the XC60 is in a collision, we’d wager that you’re more likely to crash a car that forces you to prod the display for so many functions, than one with clearly labelled physical buttons. Yes, it does offer voice control for certain functions, but these systems don't always work that well or cover everything you want them to. The CX-5 doesn’t have the best media system and it has quirks of its own – as we reported in our previous update – but being able to use a physical rotary control to navigate makes this much less distracting than the XC60. You’d expect a Volvo off-roader to provide a cushy ride, but in R Design trim and kitted out with large alloy wheels – meaning less rubber between you and the road ahead – the XC60 is actually pretty firm. Even with the supremely comfortable front seats the Volvo’s suspension may prove too firm for some drivers. Go for an entry-level XC60 on smaller wheels and the situation is better, but the suspension is still quite stiff, detracting from comfort – one of the key reasons to choose an off-roader. In comparison the CX-5 feels particularly soft and quiet. That’s true for the Mazda’s engine, too. It feels reasonably punchy and pulls smoothly even from very low engine speeds – unlike the Volvo. The XC60 also feels a bit coarser, with the automatic gearbox and heavy all-wheel drive system denting performance somewhat. Yes the Volvo is faster, but the Mazda feels more responsive normally. Around corners, on the other hand, the stiffer Volvo does feel more satisfying. While the CX-5 has overly light steering that doesn’t offer too much confidence around bends, the XC60's feels far weightier. If anything, the Volvo is more agile, though neither is particularly engaging to drive. The XC60’s automatic gearbox, meanwhile, isn’t great, sometimes getting confused about which of the eight ratios to choose. You can now get a manual gearbox, so you can change gear yourself and save some money. 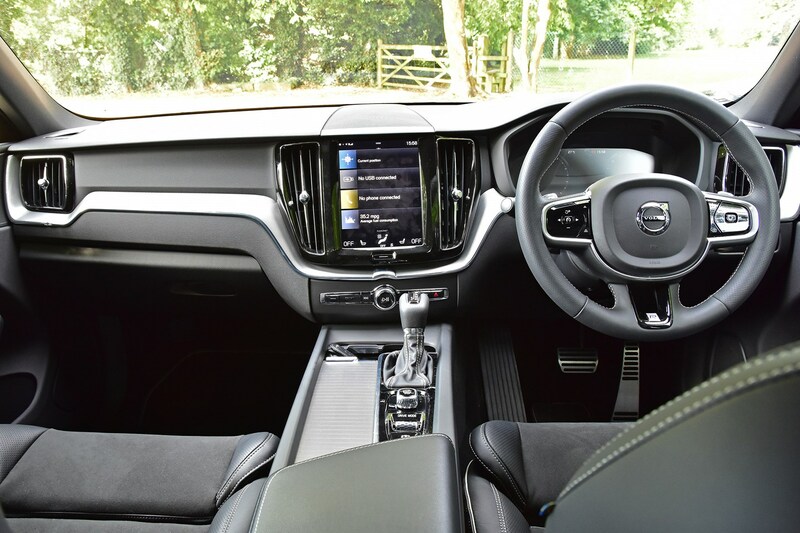 We think the XC60 looks great inside and out, is reasonably practical and overall a very desirable prospect with tonnes of standard kit. Bear in mind the huge difference in price – partly down to the Volvo’s standard all-wheel drive which offers little tangible benefit for many drivers and the dim-witted automatic gearbox – plus the flawed media system, however, and the CX-5 is a much more compelling prospect than you might expect. The Mazda doesn’t look or feel as high quality as the Volvo, but it is packed with kit and comfortable for long journeys. Bear in mind the £139-per-month saving for our CX-5 and it’s by far the more sensible option and where our money would go. 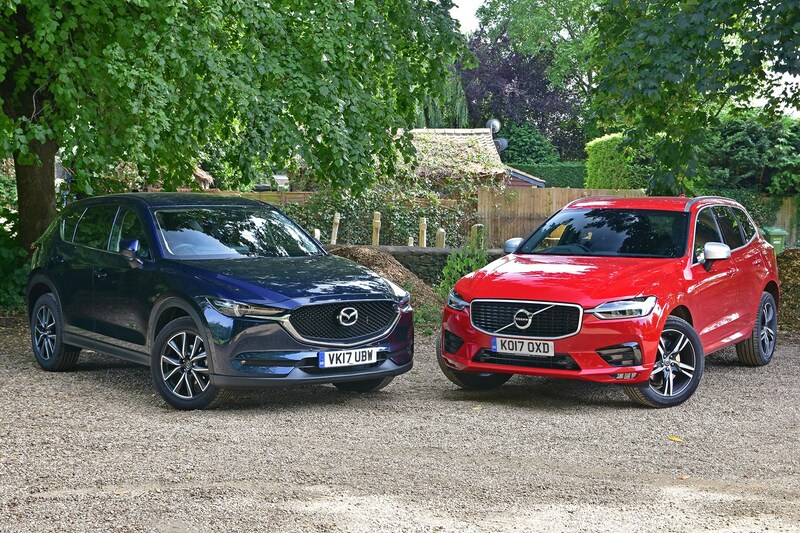 If you have to have all-wheel drive and an automatic gearbox the CX-5 – in more powerful 175hp form – is more than £50-per-month cheaper than the XC60. That’s not a big premium for the more upmarket Volvo, but we’d expect a better gearbox and media system if we were spending £530 per month on an off-roader. Whichever car you go for, though, there’s a lot to like. 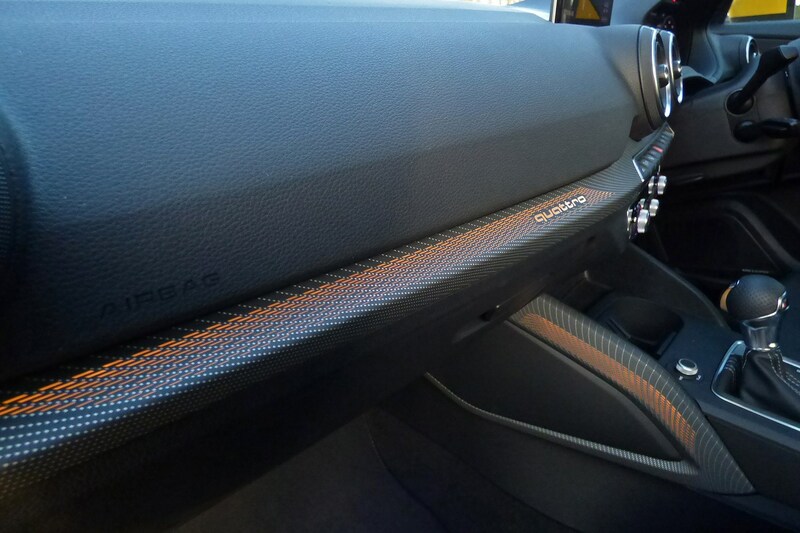 Our CX-5 is stuffed with standard kit. So much so that even with just metallic paint from the options list, most drivers won’t feel like they’re missing out on anything. However, if you often carry bikes, tow or simply want to give your car a bit of extra style, you may want to plunder the accessories list. Looking at the list, we think £850 for some slight styling tweaks is pretty steep and an unnecessary expense considering the CX-5 looks striking in the first place. Similarly, paying £550 for different interior lighting in the Interior LED pack (white) seems pretty extravagant to us – especially as that’s equivalent to a month-and-a-half’s PCP finance costs for the entire car. 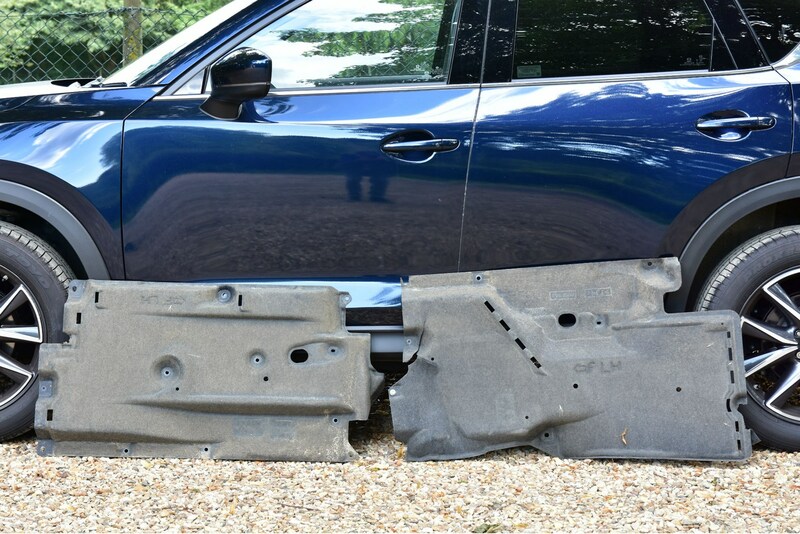 In the same manner, the Protection Pack at £450 strikes us as pricey, especially considering our car has floor mats anyway and mud flaps appear completely unnecessary on an ‘off-roader’ that lacks four-wheel drive and is likely to spend nearly all its life on tarmac. On the other hand, £380 for the Bike Pack seems much more reasonable, as does the £450 Travel Pack for those who often fill the car up with people and luggage and need extra load volume. As a result, we’ve plumped for the Bike Pack to see how well this works on the CX-5 and whether it’s an accessory box worth ticking. We’ll be getting it fitted shortly, so watch this space for all the details in a future long-term update. Keen to test out the CX-5’s ‘sport utility’ credentials, we decided to add the £380 Bike Pack for our latest update. 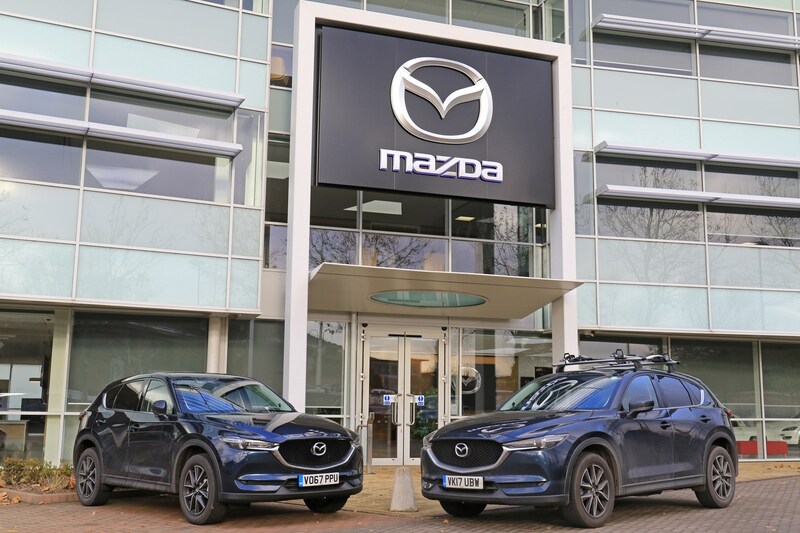 After a quick trip to Mazda HQ for fitting our car is now topped with a two-bike rack which will carry a pair of cycles in line with each other. We’ve chosen to set it up with one bike facing forwards and the other backwards, to avoid having the handlebars clashing with each other. We’re glad we asked Mazda to fit the rack for us, as fitting took around 40 minutes – not too long in itself – but seemed to involve countless small fittings. If you’re more adept with a hammer than an allen key you’ll want to ask your dealer to fit this for you – for which they’re likely to charge you a reasonably small fee. 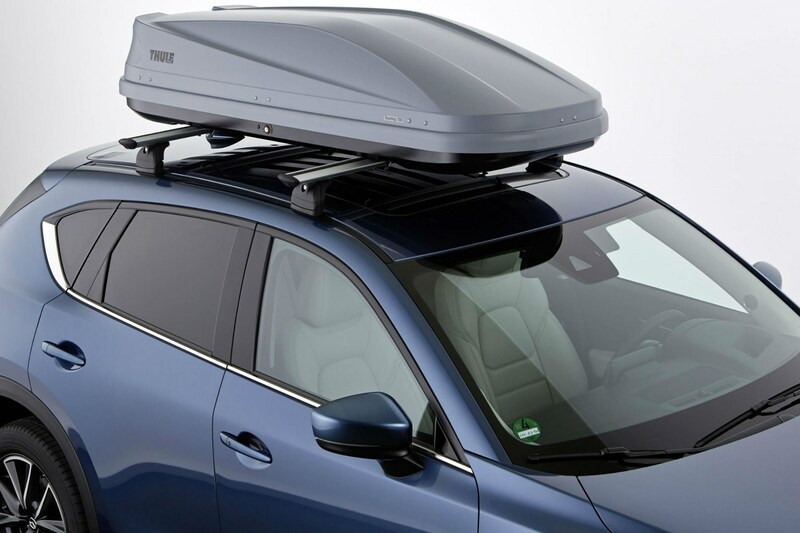 Once fitted, however, the Thule carrier seems to be supremely sturdy. With a key to lock it securely in place, it should be unstealable too. Raised above the roof as it is, we wonder how much it will increase wind noise on the motorway and hinder fuel economy due to the worsened aerodynamics. 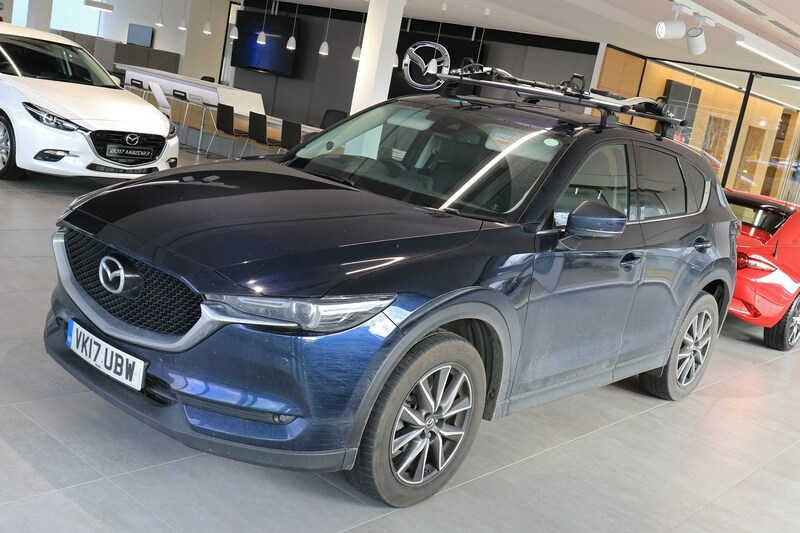 With the roof bars fitted in Dartford and our office in Peterborough, we had plenty of motorway to assess any changes to the CX-5’s refinement levels. The car is pretty refined on the motorway normally with little engine, road or wind noise to speak of. We expected a jump in volume following the new addition, but were surprised when additional noise was audible from as little as 40mph. It’s not obtrusive at lower speeds, but makes it sound like you’re driving into a strong headwind. Bump up the speed, however, and the extra wind noise is obvious. It’s not offensively loud, but it’s enough to give you another reason to remove the bike rack if you’re not planning to carry anything on it for a while. Plus, you have the prospect of worsened fuel economy. Load anything on top of your car and you’ll worsen its wind resistance, causing the car to use more fuel – especially at higher speeds when aerodynamics have a bigger impact on fuel consumption. For a reasonably chunky construction like this rack we expected a drop of around 10% might be possible, as we cover a lot of motorway miles. However, over one-and-a-half tanks of diesel we’re yet to notice a difference in how much diesel the CX-5 is consuming. 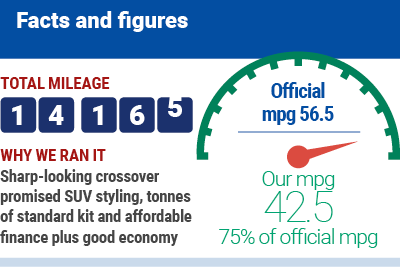 Our 150hp two-wheel drive model seems to have levelled out around the 43mpg mark in fuel economy terms – nearly 25% down on its official figure – though initially at least we’ve matched that with the new roof rack. Oddly, though, the economy meter alongside the speedometer seems to show a drop in consumption compared with what the car had been returning before. 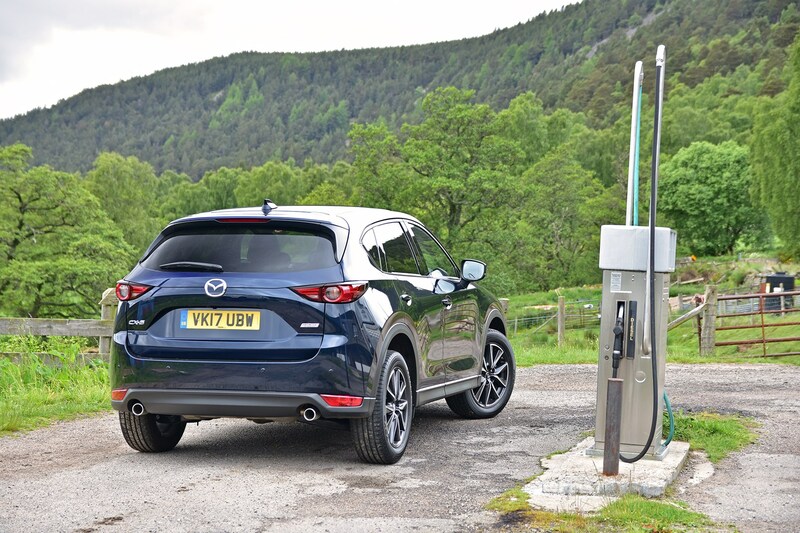 Therefore, we’ll wait until the CX-5 has munched its way through a few more tanks of fuel before passing judgement on just how much more fuel the car may be consuming. Off-roaders may be popular for their raised ride height, but come to loading anything on the roof and you’ll curse that added altitude. Even watching Mazda’s fitters putting the bike rack together highlighted that it’s likely to take several people some careful manoeuvring to get a couple of bikes on the roof. Compared with a similarly practical estate car – such as the Mazda 6 Tourer, which actually boasts a bigger boot too – this is likely to make life harder for CX-5 drivers. Unless you have a helper, loading a bike onto the roof when you need to stand on the doorsill to be able to reach, is likely to prove a little tricky. Sub-zero temperatures and a nationwide smattering of snow recently has discouraged us from donning shorts, helmets and digging out our bikes just yet. 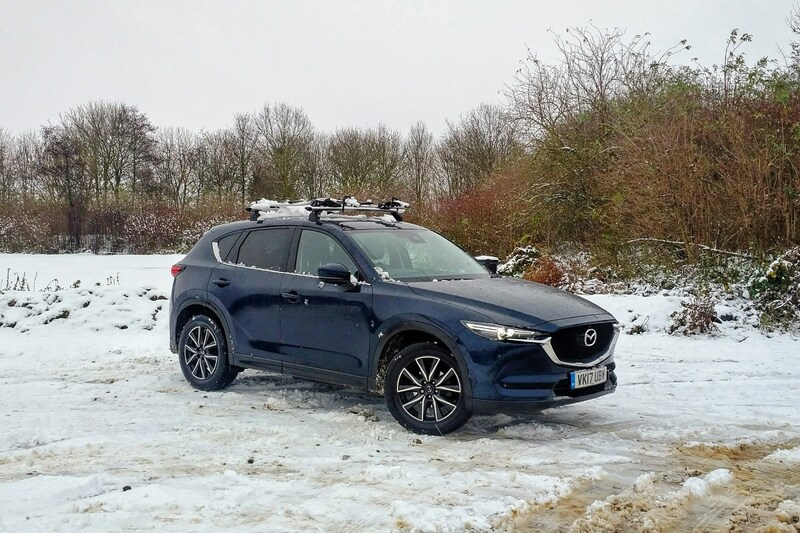 The snow at least was a chance to assess how well our two-wheel drive CX-5 deals with tough weather conditions – one factor that encourages many drivers to choose an ‘off-roader’, regardless of its tangible off-road credentials. And the news isn’t good. With additional weight, two-wheel drive and summer tyres, the CX-5 is no better on slippery roads than any standard hatchback or estate. In fact with an additional 86kg of heft over the equivalent Mazda 6 Tourer and fat tyres which offer mediocre grip even on simply wet roads, we’d wager that you’re more likely to get stuck in this so-called SUV than the estate equivalent when snow falls. Update 11: small upmarket Audi, or large, well-equipped Mazda? Since collecting our CX-5, the monthly payments for new customers have been steadily dropping – making it more and more affordable to run on PCP finance. Our car without options - bar metallic paint - which would have cost £449 per month in June, was less than £415 a month in October and is now just £382 with the same contract terms (36 months, £4,229 deposit and a mileage allowance of 9,000). 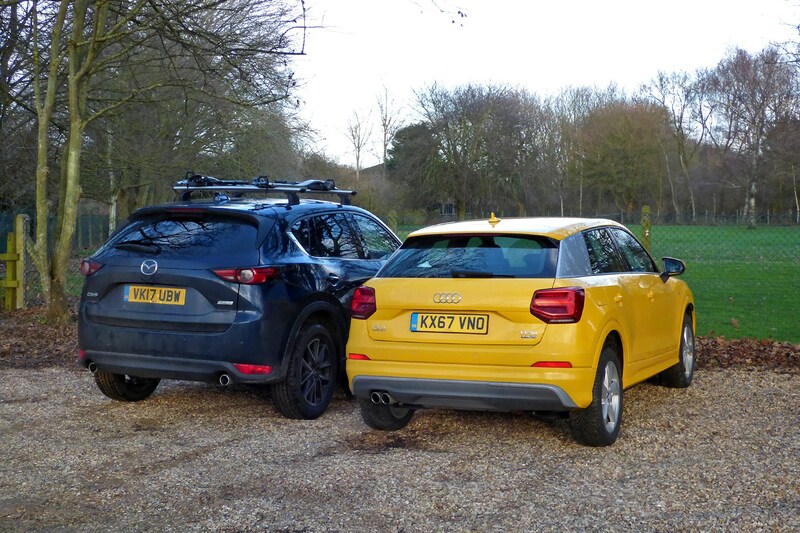 Upmarket Audi Q2 or practical Mazda CX-5? For that price it’s not only value-oriented mid-size SUVs you can get, but upmarket smaller ones too including the Audi Q2. 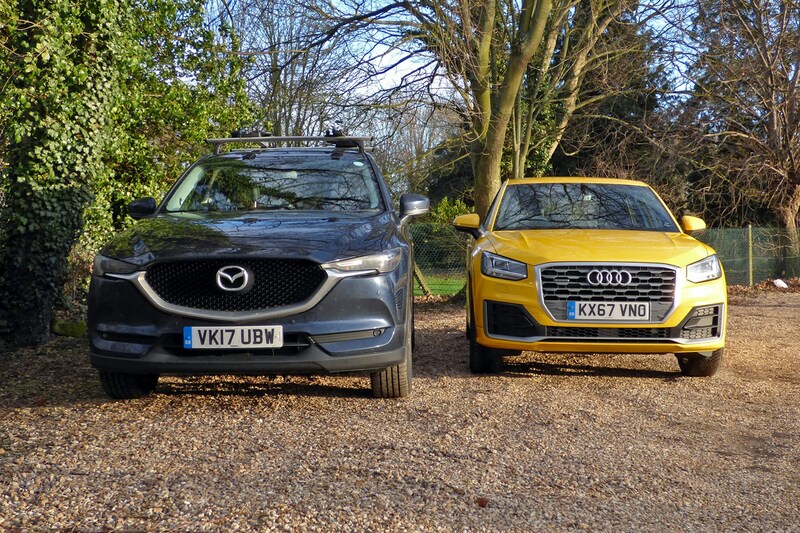 Testing out whether opposites attract, we put the all-wheel drive, automatic 2.0-litre petrol Q2 S line up against our two-wheel drive, diesel, manual Mazda. Yes the Audi is still a little pricier – to the tune of £14 per month – at £412 per month compared with £398 for the Mazda (on a 36-month, 10,000-mile-per-year contract with a £3,000 deposit), but it still feels like a much more upmarket machine. Even just sitting behind the wheel, the door shuts with a far more substantial clunk, the wheel is wrapped in softer leather, the materials feel higher quality, the design is more modern and the seats are slightly more supportive in the Q2. 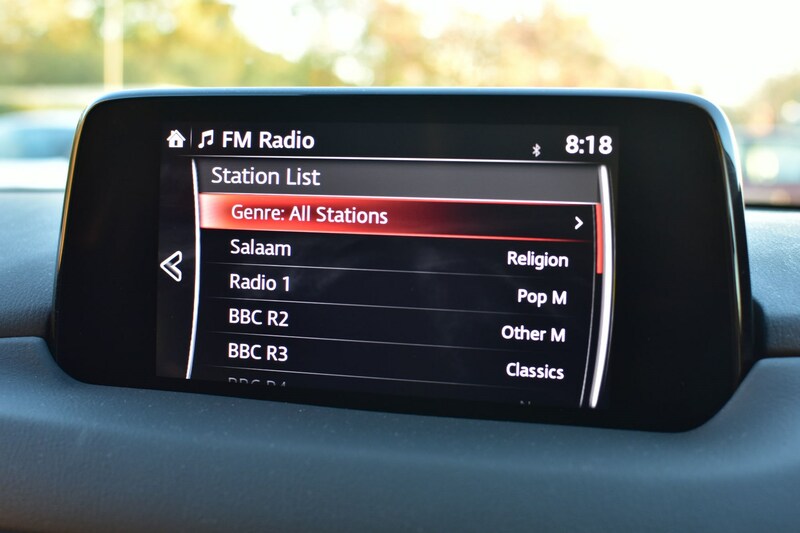 The Audi’s media system – upgraded here in the £1,395 technology pack – shares its format with the CX-5, a rotary wheel controlling a screen that sprouts from the top of the dashboard. In the Audi it’s slicker and easier to use than in the Mazda – and tuning the radio is a far less arduous experience. Select a station onscreen using the rotary control in the Mazda and the display jumps right back to the top of the list of stations, meaning you have to scroll all the way down again if you want to pick another station. Yes, there are steering wheel controls for this, but with no display alongside the speedometer to see what you’re selecting, all you can do is glance at the media system to see what you’ve chosen. Considering you often end up scrolling through dozens of frequencies for the same radio station before moving onto the next, this quickly becomes infuriating. 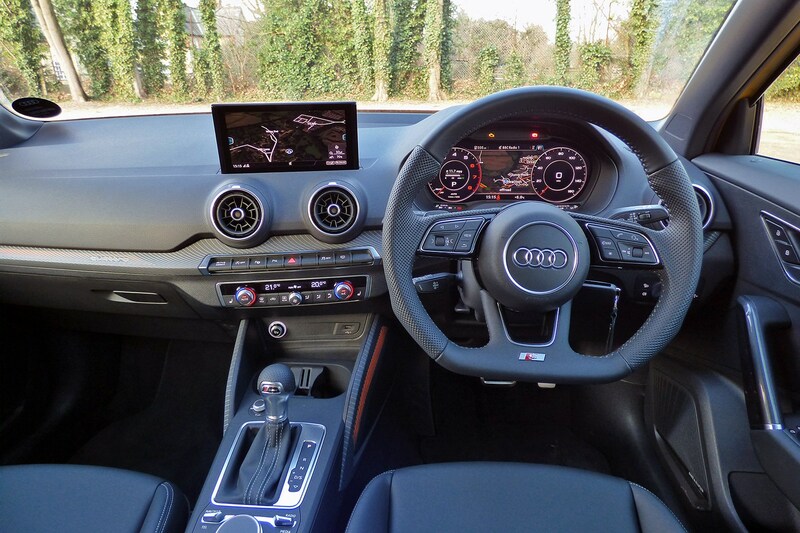 In the Audi, however, you can scroll through stations displayed alongside the speedometer using the steering wheel controls, which is quick, simple and intuitive. The Audi wins more points as you can enter addresses for the sat-nav by drawing letters on top of the rotary control – speeding up the process of selecting individual letters. Hit the road, meanwhile, and the Q2 continues to impress. The petrol engine is potent, refined and well matched to the automatic gearbox. Refinement levels are strong too, with little wind, road or engine noise making itself heard. Supportive seats and smooth suspension make the car very comfy for longer trips too – bettering the CX-5 on both counts. 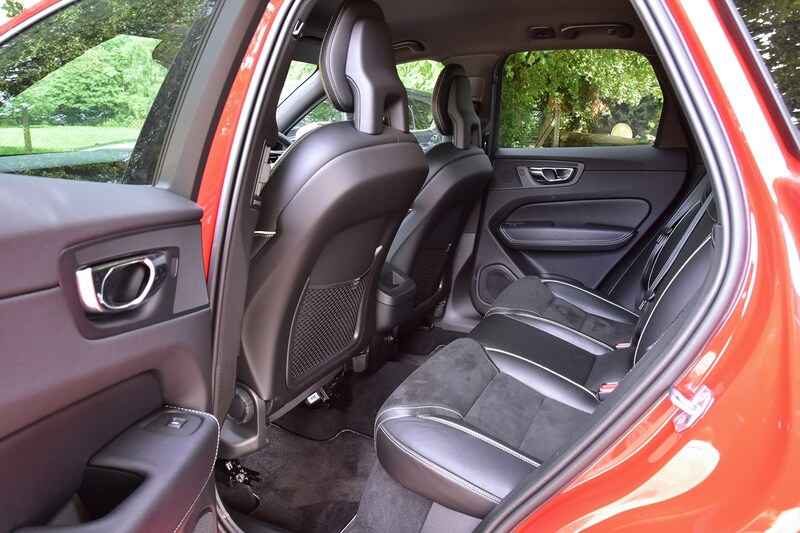 In comparison, we don’t find the CX-5’s seats the most supportive, with long-distance trips highlighting this, while the Q2 is smoother on rougher roads too. 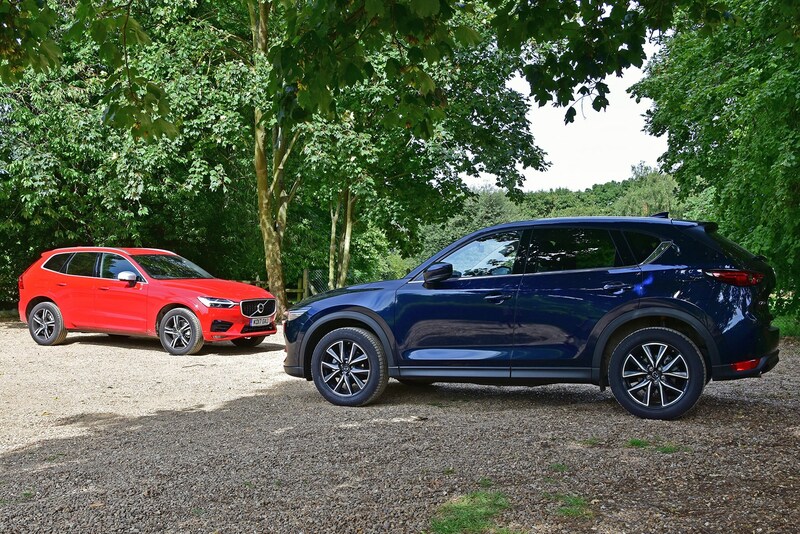 The Q2 is also more satisfying to drive, with the steering proving much more precise than the CX-5’s overlight setup which leaves you feeling like you’re regularly adjusting the wheel just to maintain a straight course. As a result, the Q2 is both more relaxing to drive on the motorway and it offers far more grip in corners providing a much greater sense of confidence – whether you’re a keen driver or simply want to get home safely whatever the conditions. It’s also by far the faster car, offering effortless acceleration, though the CX-5 is more than fast enough for most drivers. Practicality, however, is where the Q2 simply can’t compete. It’s 36cm shorter on the outside and that’s clear on the inside. There’s adequate space in the back for two adults, but taller passengers may feel a little cramped. 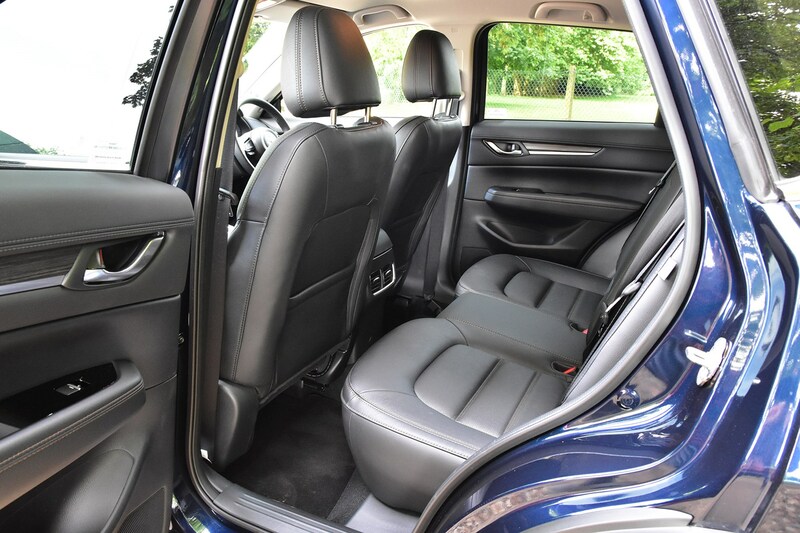 Despite this, the seats are impressively comfy, but it’s dark in the back and each door doesn’t open very wide – especially compared with the CX-5 where it swings out to nearly 90 degrees. What’s more of a problem, is the sheer cost of the Q2. While it’s just £14 per month more than the CX-5 in standard form, our car weighs in at a ludicrous £569 per month with the options fitted. And it’s not as if this Q2 comes with much kit that the CX-5 doesn’t have, and that would cost you £415 per month with matching contract terms (36-month contract, 10,000 miles per year, £3,000 deposit). 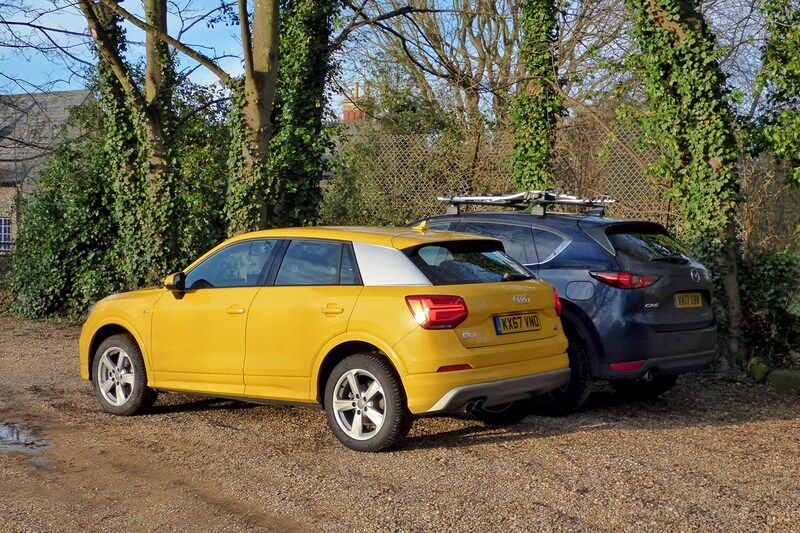 For £4 per month less than the yellow Q2 you could get the 175hp all-wheel drive, diesel, automatic CX-5 with every option available fitted or Audi’s far larger, more luxurious Q5 in all-wheel drive, diesel, automatic form. 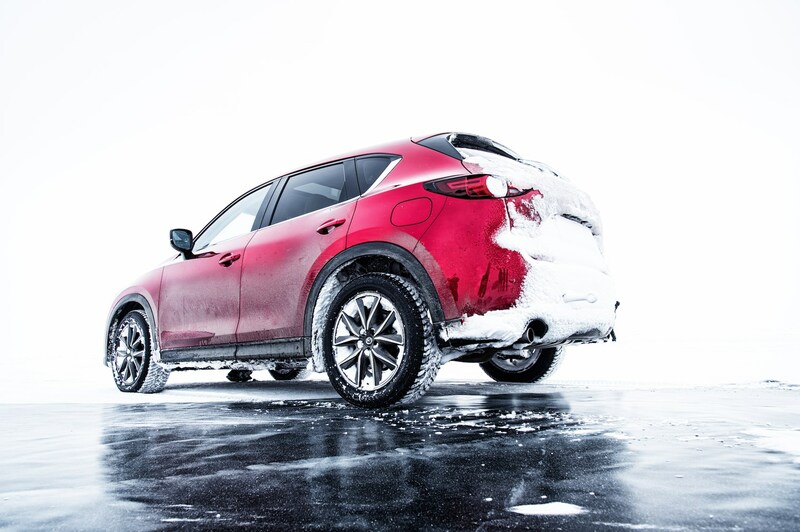 As much as we liked the Q2, therefore, it’s our CX-5 that’s come out on top. You get so much more car for your money, that we can forgive it a few quirks, such as the annoying media system, vague steering and less comfortable seats. 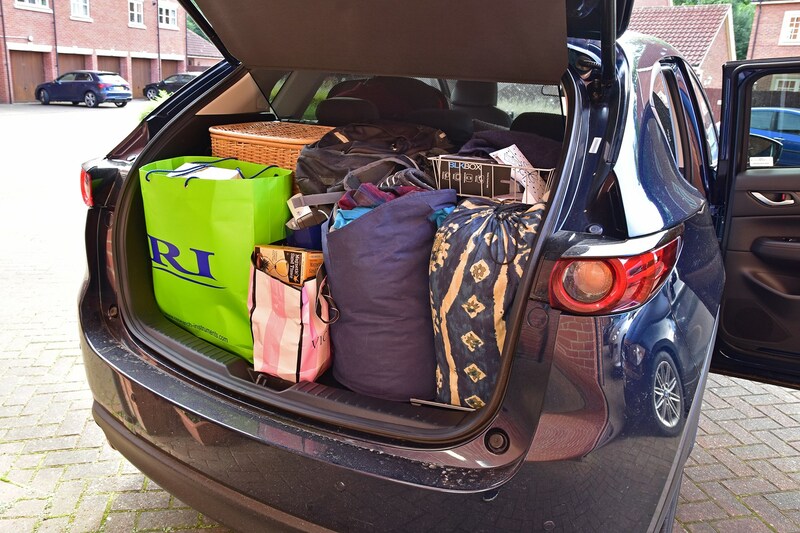 If you take the title ‘sports utility vehicle’ seriously, our Mazda CX-5 SUV should be well equipped for loading up with bikes, sailing kit, outdoor gear and other family paraphernalia. 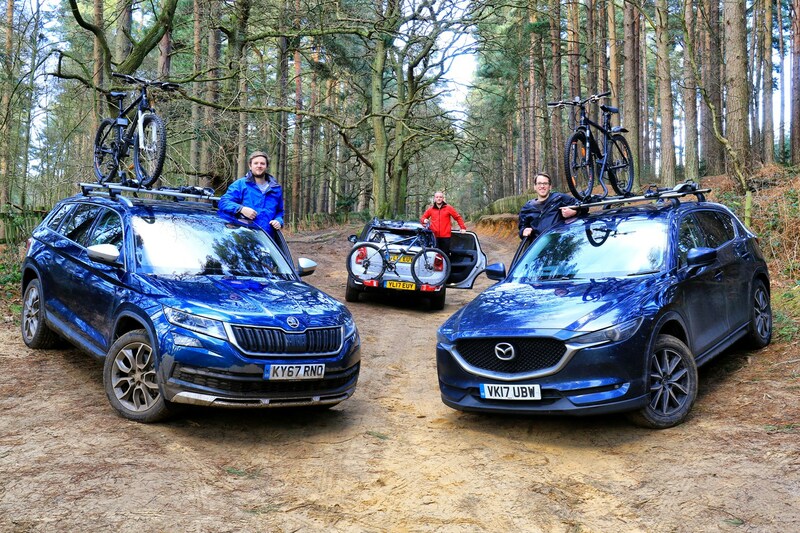 So we thought we’d test out its practicality credentials with a Parkers three-way bike rack test – putting it head-to-head with Tom Goodlad’s smaller MINI Countryman and Adam Binnie’s larger Skoda Kodiaq. Like the Mazda, the Kodiaq features an optional roof-mounted bike rack. 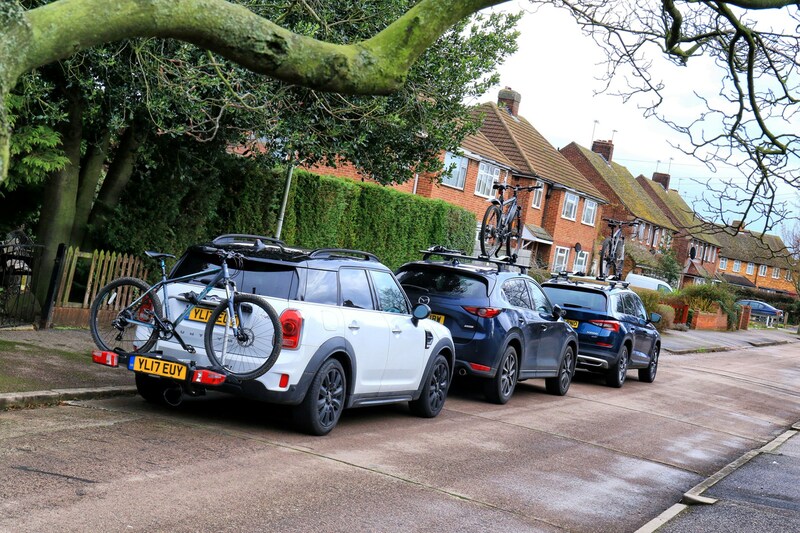 Meanwhile, the Countryman is available with a towbar-mounted bike stand, which increases the length of the car but makes loading bikes much easier and means you don’t have to worry about height restrictions. So how does the CX-5 fare? The high-riding nature of SUVs means that not only do you have to climb in yourself, but loading stuff onto the roof is far more difficult than with an equivalent estate car. 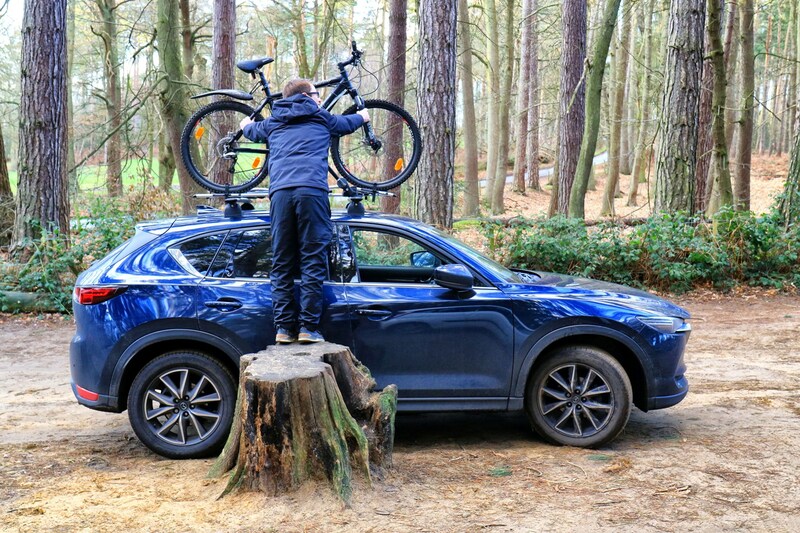 Compared with the Mazda 6 Tourer the CX-5 is more than 20cm taller, making it much more challenging to load anything onto the roof – even if you have a conveniently placed tree stump. In fact, the CX-5 is even a little taller than the Kodiaq. 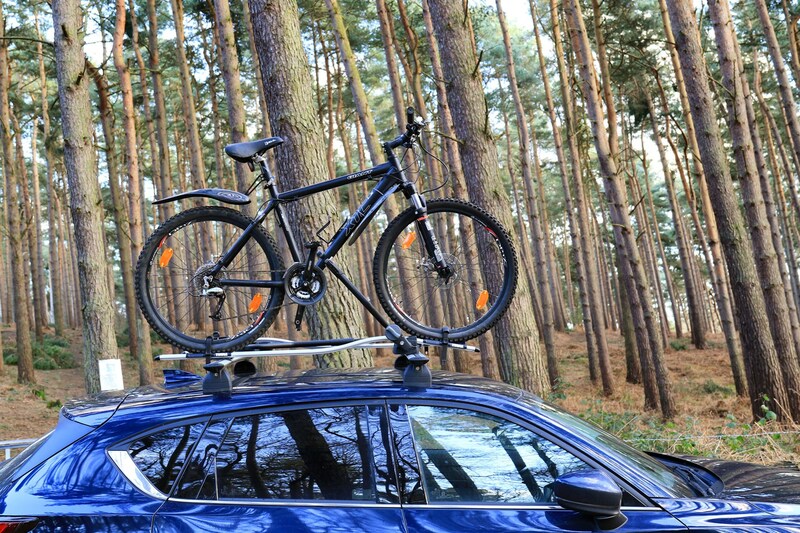 If you regularly plan to load bikes, roof racks or other gubbins onto the top of your car, it’s worth thinking about how you’re going to load and unload it all. Suffice it to say that having seen how easy to load the Countryman’s towbar-mounted bike rack is, I’ve got serious rack-envy. If I had to single-handedly get a bike onto the CX-5’s roof I think I’d give up, fold the seats down and chuck the bike in the boot instead. 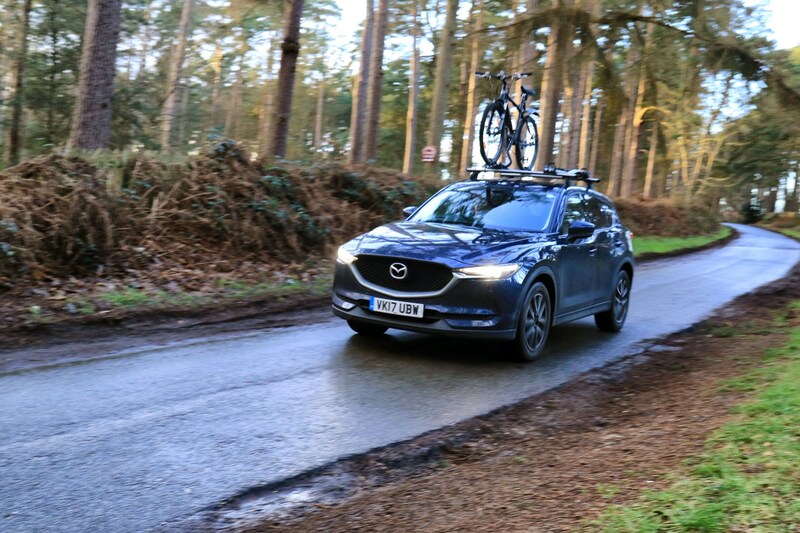 However inconvenient the CX-5’s high body makes loading the roof rack, the device itself is satisfyingly easy to use, making it quick and simple to secure a bike in place – provided you can reach. This involves sitting the bike’s tyres in the two recessed dips in the rails and then ratcheting these in place with individual straps. Next there’s a support bar that extends up away from the roof, with a clasp that you can close around the bike’s frame. Tighten this up and the bike is reassuringly secure. With a selection of keys coming with the rack you can lock the bike in place, too, meaning that no one can nab it off the roof, should you have to stop en route during a long journey. We’ve already complained about the hurricane of noise that the roof rack throws up from speeds as low as 40mph – even without a bike attached. 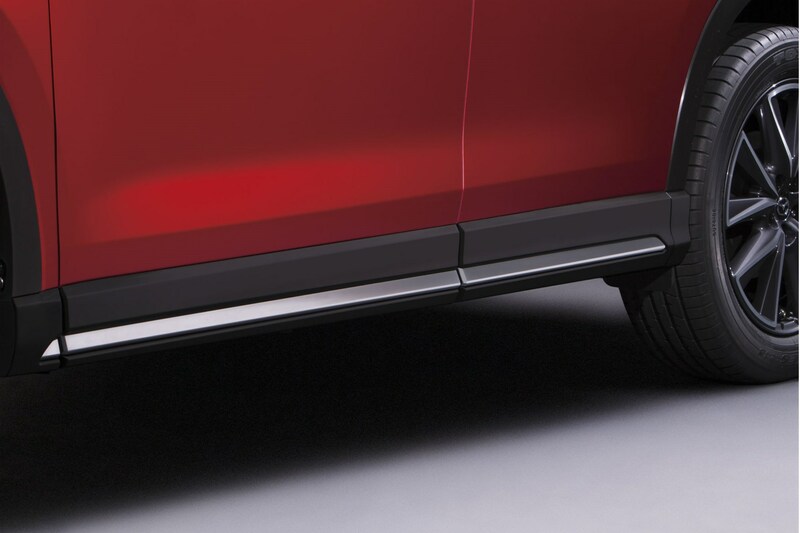 Look at the car’s profile and it’s clear the rack sits further forward than the very similar system fitted to the Kodiaq. This may explain why the Kodiaq’s version is barely audible in normal driving, while the Mazda’s seems to disturb the flow of air around the car adding to the volume levels. Thankfully, though, we noticed no real difference in noise from adding a bike to the roof. This differs from the Skoda where the bike made the Kodiaq noticeably louder on the motorway. 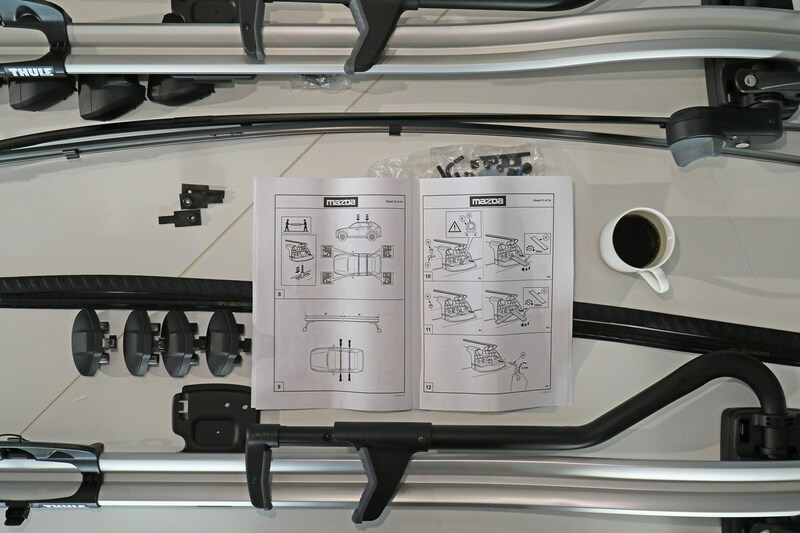 Unfortunately, while the Kodiaq comes with roof rails, the Mazda doesn’t, making fitting the roof bars themselves a far more arduous process. 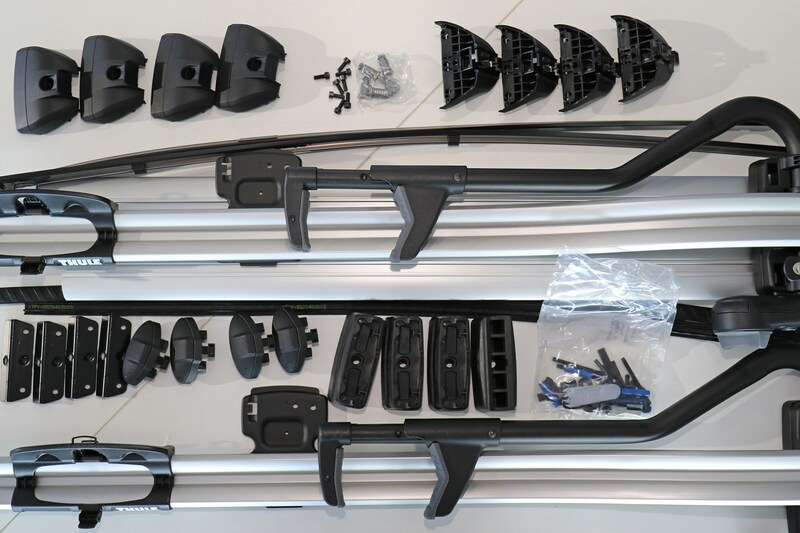 This means that to address the frustrating wind noise thrown up by the roof rack, taking the whole rack on and off is a more time-consuming process. To be frank, the hassle for us would dissuade us from fitting the rack back at all. 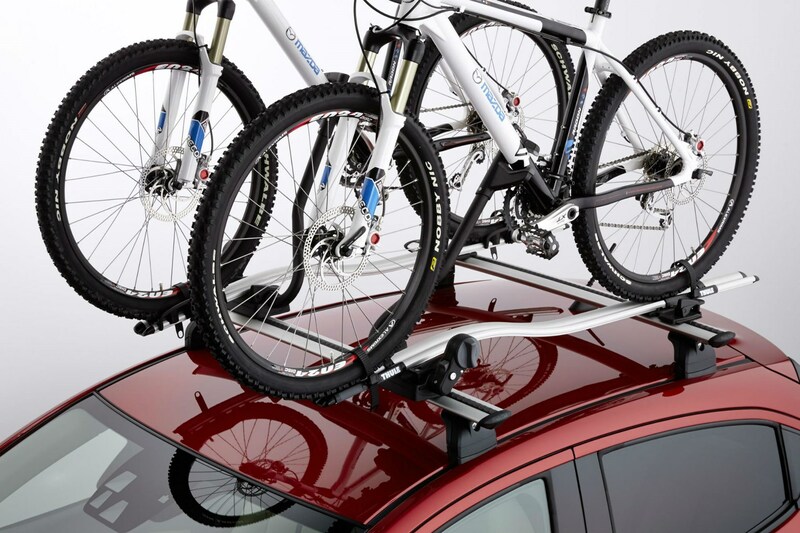 Weirdly, the closely-related Mazda 6 Tourer does have roof rails as standard, making it a more practical process to take a bike rack on and off. We’ve already questioned the benefits of opting for a CX-5 SUV over the 6 Tourer estate that Mazda also makes - and those questions still stand. 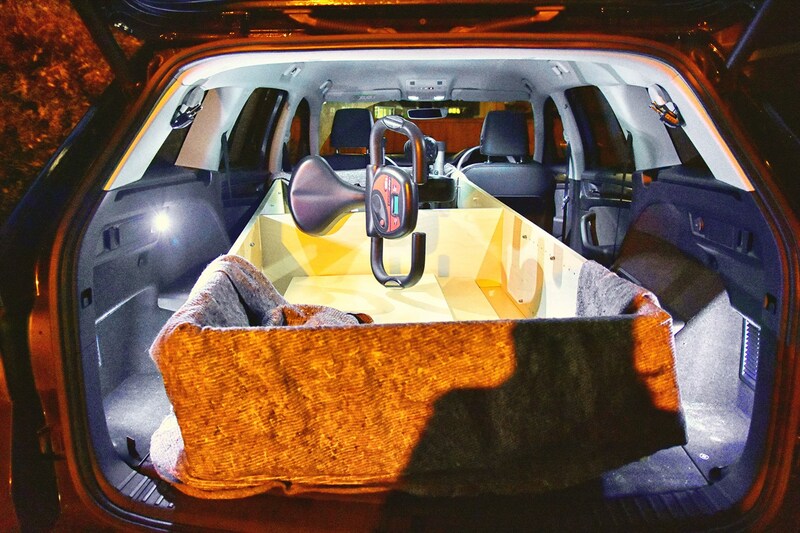 Not only does an equivalent 6 Tourer include roof rails, it’s much lower making loading the bike rack a far less daunting feat and the boot is bigger, too – whether you have the rear seats up or down. The 6 Tourer’s other figures speak for themselves, as well. It offers claimed fuel economy of 64.2mpg compared with 56.5mpg, accelerates faster to 62mph and is cheaper, whether you pay cash or finance it. Expect to pay an additional £800 for the CX-5 or £45 per month more on a 36-month PCP finance contract (with a £3,000 deposit and 10,000-mile-per-year allowance). Yes, this is a smaller difference in monthly payments than when we picked the CX-5 up – as Mazda is now discounting its mid-size SUV – but we still don’t think the CX-5 warrants a premium. Since our CX-5 lacks four-wheel drive, there’s nothing to differentiate it from the 6 Tourer apart from the slightly higher driving position and squarer looks. These may appeal to some drivers, but we prefer the handsome looks of the 6 and its sharper but more comfortable road manners, plus the more useful boot. Part of the remit of an SUV – a Sports Utility Vehicle – is to be practical enough to deal with all your sporting pastimes. 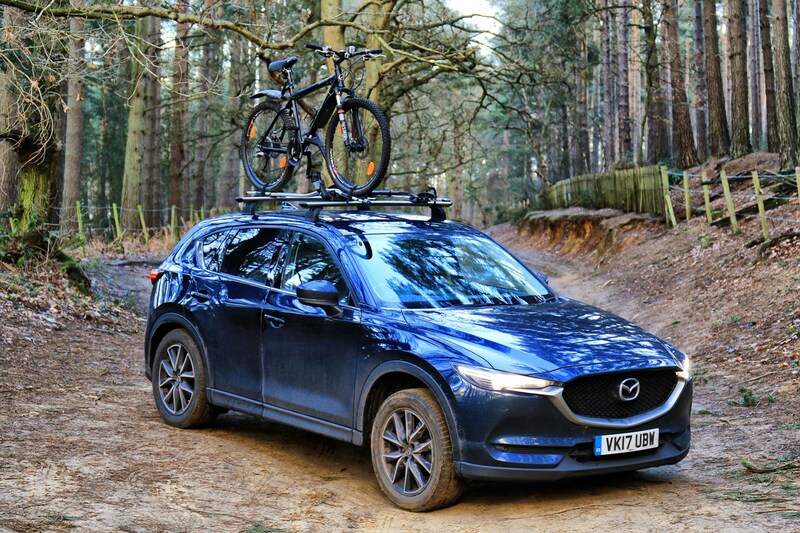 As we established in our last update, though, if cycling is your thing, the CX-5 is beaten in the practicality stakes by its cheaper sibling, the Mazda 6 Tourer, which offers an even larger boot and has standard roof rails and a lower roof, making it easier to load bikes. But how does it compare against two of the off-roaders on the Parkers fleet – the Audi Q5 and Skoda Kodiaq – if you need to carry furniture inside the car? Measuring in at 4,550mm long, the CX-5 isn’t the largest car in the class, but it is still feels big to drive, so you’d hope it’d mirror that with a usefully large boot. Moving house previously, we found we could stuff tonnes of luggage into the back of the Mazda with the overall volume impressing – and all this is without dropping the rear seats for maximum space. However, fold the back seats down and there’s not as much room as you might hope for. With a 2m-high fully-constructed bookcase to manoeuvre inside, we had to slide the front passenger seat all the way forward and fold the backrest as near to the windscreen as it would go. After a little careful coaxing the bookcase finally fitted inside the car, albeit resting awkwardly on the front seatbacks. 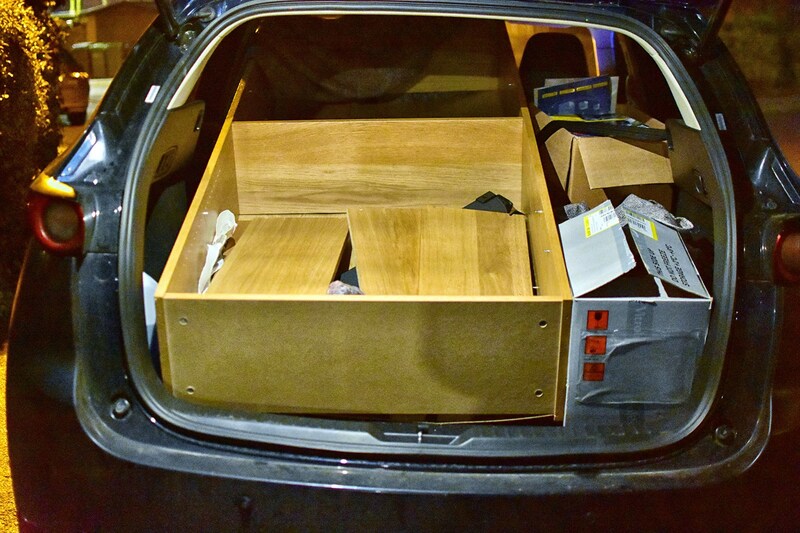 Some further coaxing later, and we managed to close the boot, safely holding the bookcase in place. 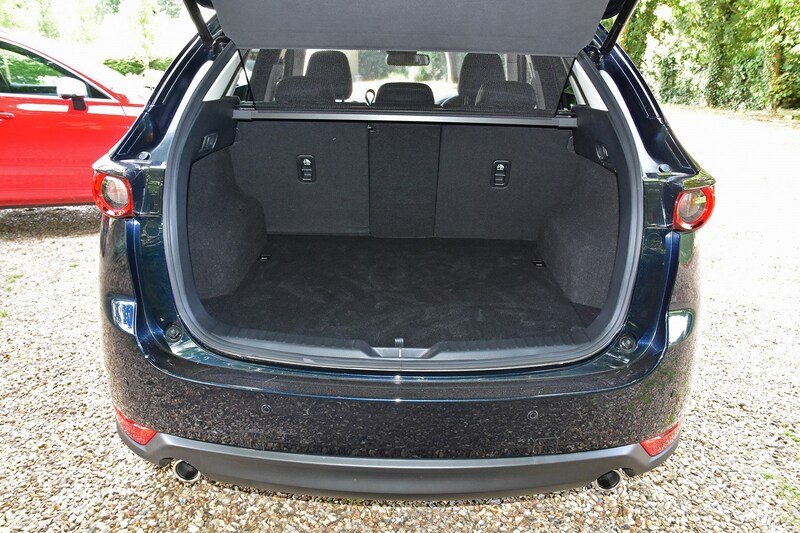 The Q5 stands out from the CX-5 for feeling much more upmarket, rather than being notably bigger – though it is 11cm longer – however it offers around 10% more boot space with the rear seats up. 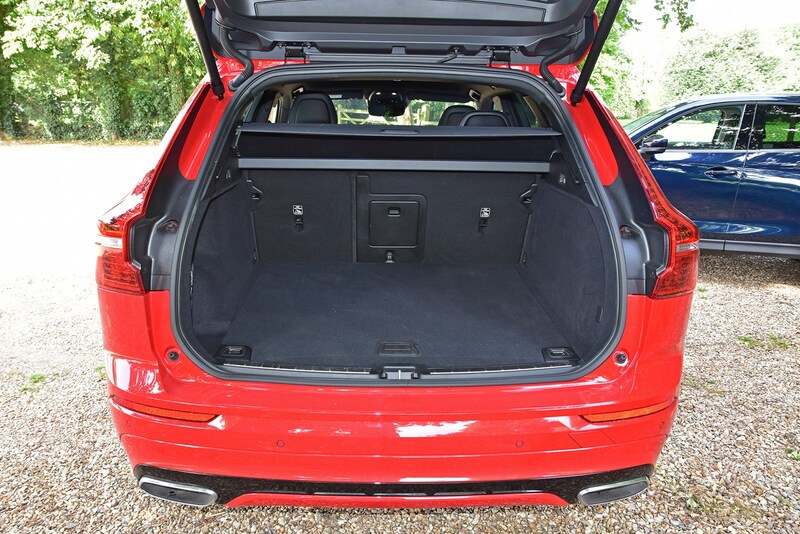 Topple the seats, though, and it’s the Q5 that is the smaller car inside, so we weren’t sure whether it would manage with such a long load – especially since the Audi majors on quality over sheer space inside. 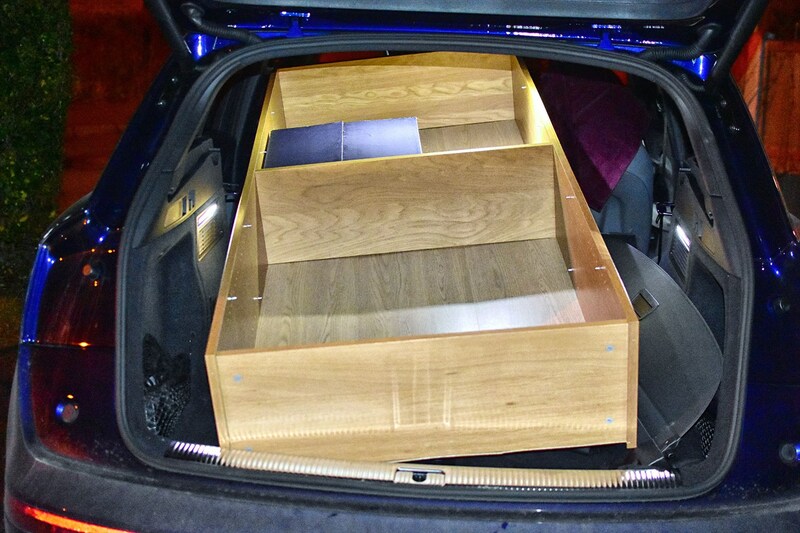 As with the CX-5, easing the bookcase into the back of the car saw it eventually fit, though the narrower gap between the front seats meant it would only squeeze in at an angle, so a little rejigging was necessary for it to sit safely in place. It may be only 3cm longer than the Q5, but the Skoda Kodiaq is enormous inside in comparison. The difference is just as stark against the CX-5, so we had no doubt that an identically-sized bookcase would fit inside without issue. As there was more than enough interior length for the bookcase it could sit flat on the floor, rather than having to rest on the front seat backs. 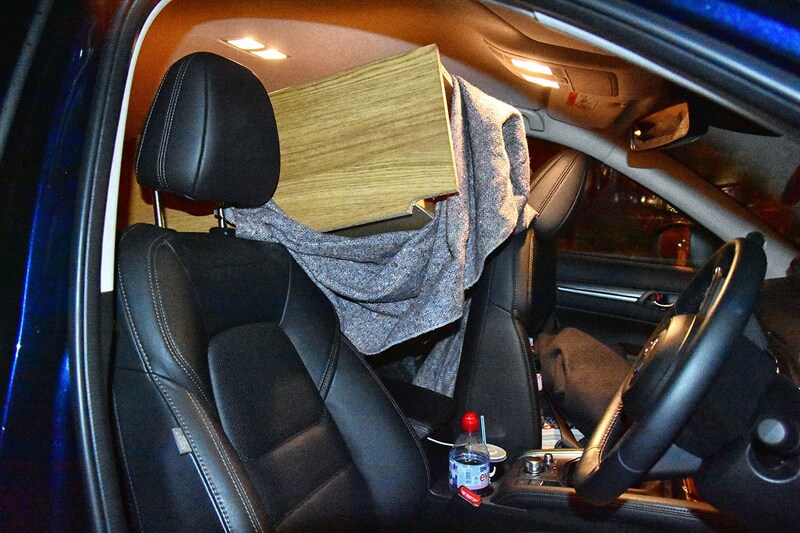 Not only did this mean less chance of damaging the bookcase, but it also left a much clearer driver’s seat – with vision unimpeded – making for a safer, more relaxing drive home. Yes, our high-spec Scout is pricey compared with the Mazda, but considering much cheaper models are available, this is still a lot of car for the money. As a similar Kodiaq is just under £20 per month more than our CX-5 – with standard-fit automatic gearbox – this seems like a far more sensible option for those who need to make the most of the ‘U’ part of their SUV. Update 14: Mazda CX-5 – off the pace? Having spent some time in the CX-5 I was quite surprised by how quiet it was on the road, especially the lack of noise coming from the diesel engine into the cabin. So much so, I was convinced it was a match for my folks’ Jaguar F-Pace – a larger and more expensive SUV – for quietness. Naturally, I had to drive the two back-to-back to find out. 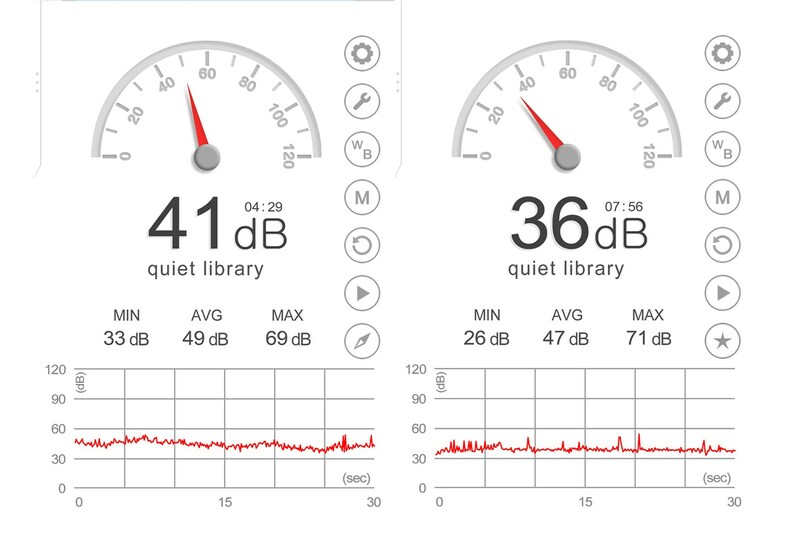 Admittedly, this might sound like a my-first-science-lesson approach, but in an attempt to try and at least quantify the difference in noise levels, I employed the use of a sound meter app on my smartphone to measure the volume in both cabins. I drove both cars in sequence on the same route, with the phone placed on the centre armrest. While the CX-5 has the quieter and more refined engine, it was actually 5db louder in the cabin overall. The engine may be more hushed inside throughout its rev range, but there's more road and wind noise filtering around the doors. With all noise levels on an even keel, the cabin still feels relatively quiet in here as no particular aspect makes itself heard above the rest. Jump straight into the Jaguar and you notice a step up in refinement, with road and wind noise better filtered out, making for a much more serene cabin. This is despite the Jaguar riding on larger 20-inch wheels, over the Mazda's 19-inch equivalents. What spoils the ambience however is the pronounced engine noise. Because the rest of the cabin is quiet, the coarse engine note feels even louder than it is in the cabin; so much so it can become irritating after a while and you'll want to settle down to a cruise as soon as possible. It's not like this Jaguar SUV wasn't designed for an engine of this configuration either. The model you see here is the 25d Portfolio - the higher-powered four-cylinder diesel in the F-Pace range – and the lower-powered variant of this engine, badged 20d, is quieter on the move, beating this for refinement. Does it trump the Jaguar elsewhere? Not only is the head-up display a standard fit on the CX-5, it's also much clearer than the orange monotone equivalent we've seen on Jaguars. This might be nerd levels of nit-picking here, but the windscreen washer jets work better than the F-Pace too, providing a much more even distribution across the width of the screen. Where the CX-5 begins to fall over is in the cabin, where it lacks any luggage hooks in the boot to prevent shopping from being flung around and the weak ventilation system leaves you waiting around far longer for the windows to demist in the morning. Forgive us for going off-topic a little with Chris' long-term test. But when the UK was recently hit by The Beast From The East, leaving much of the UK stranded, we wondered why so many stricken cars appeared to be family SUVs beached in snow drifts. 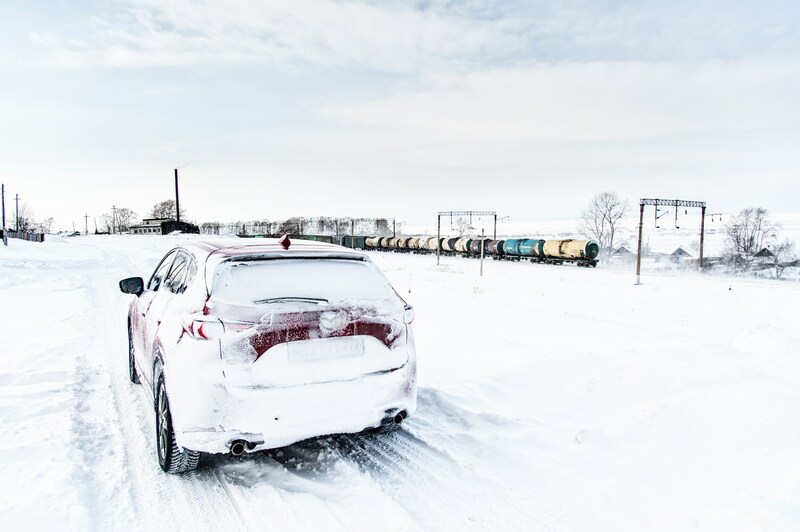 Inspired by this thinking, and Chris' insistance that his long-term CX-5 didn't cut the mustard in the poor weather, I thought it would be good to relay my recent findings from a trip to Siberia in a four-wheel drive Mazda CX-5 on winter tyres. Taking it somewhere extremely cold, snowy and slippery seemed like the perfect test. 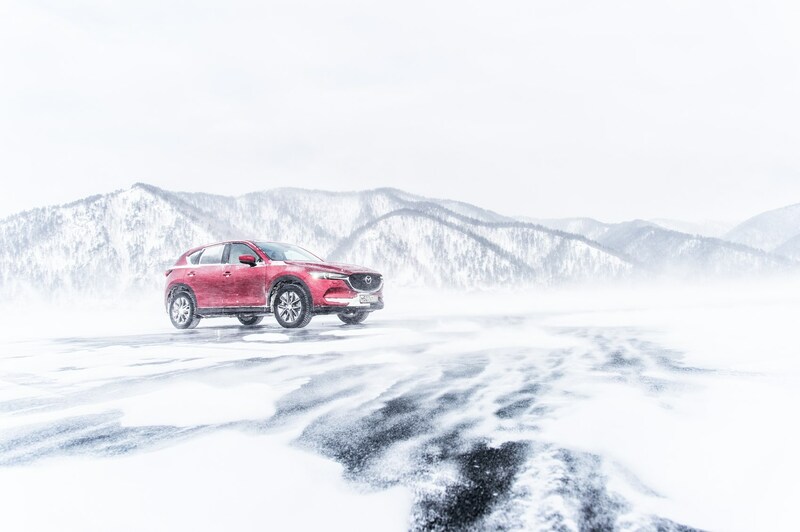 So when Mazda said that there was the opportunity to drive across Lake Baikal at its frozen best, tackling zero-grip surfaces, snow banks and dodging man-sized ice shards at the same time, who were we to say no. If it could handle this, there would be no excuse for Chris to moan about a little UK snow flurry. We're telling the full story of this driving story on the CAR website, but as far as Parkers goes, we're happy to offer this essential consumer advice. So – how does one drive on ice? Firstly, look ahead. Look a long way ahead. Secondly, be slow, smooth and deliberate in your inputs at the wheel and the pedals. And thirdly, remember that freshly-laid snow has lots more grip than ice. The Mazda's clever four-wheel drive transmission does a great job of getting the power down in low-grip conditions, and it will take a lot to unstick it in poor weather – especially on winter tyres. But even this won't mitigate against zero-grip conditions, so the best tactic to keep it under control on ice, is to avoid it in the first place. Snow is easier to deal with. As we've already hinted at, this four-wheel drive Mazda's clever transmission does a great job of keeping you out of trouble. In Siberia, where the snow was particularly dry and dusty, there was a surprising amount of grip to play with, and as long as you consider your braking distances carefully, then you'll be fine. The main thing to consider is that when the snow gets deep, you must keep moving. And that takes concentration and anticipation. If you see deep snow ahead, don't stop as long as there's a route through. Just aim for where you're going, and maintain your momentum. Again, be smooth and deliberate at all times and keep plenty of distance between you and all the cars around you. And finally: remember your brakes. What we found is that the four-wheel drive system buys you lots of traction and confidence, but doesn't alter your stopping distance. If you don't leave enough room, no amount of clever transmission will help you. Mainly that with the right tyres, preparation, and a mature approach to driving, a Mazda CX-5 will go places you'd never possibly dream of taking one. Okay, so this drive was on the extreme end adventurous, but it does prove that even a modest SUV is near-unstoppable in the right hands. In reality, you'll never get near to experiencing these conditions in the UK, but it's good to know that if the climate goes doo-lally any-time soon, you'll be able to beat the worst of it in your CX-5. Just remember to tick the four-wheel drive option box, and stick on a set of winter tyres before winter kicks in. 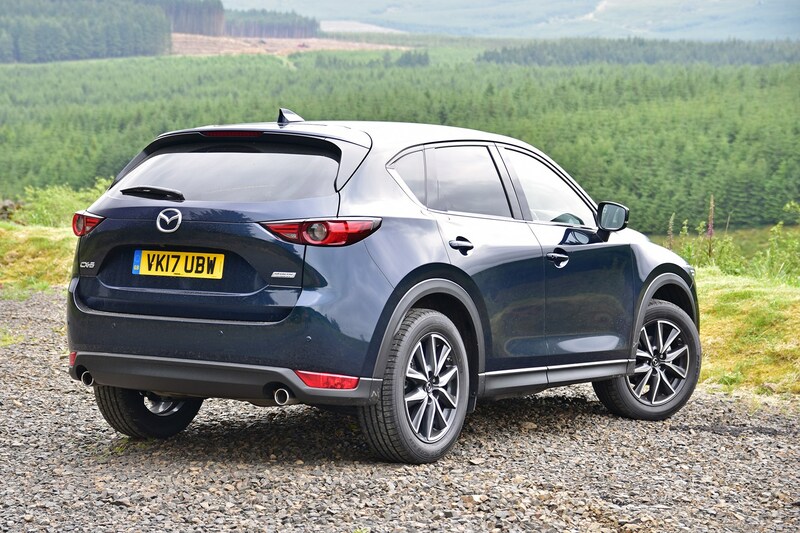 We’ve been driving the CX-5 – in bestselling 2.2d 150hp Sport Nav form – for nigh on a year. In that time it’s impressed us with how much standard kit it offers, its very refined and punchy diesel engine and by swallowing a surprising amount of luggage – although it lags behind our long-term Skoda Kodiaq in the bookcase-carrying stakes. PCP finance prices have come down since we picked up the keys, too, making it a good value option for cash and finance customers alike. However, it does have its flaws – several of which mean that numerous times I have looked for the keys to something else of an evening – and a number of rivals offer very stiff competition. So would we recommend it? 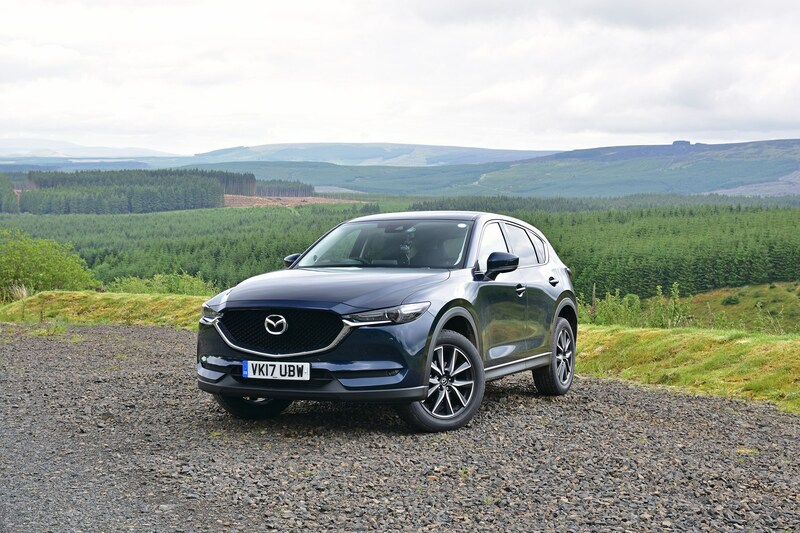 The CX-5 is a good value off-roader, but a worse value car; as with many SUVs it carries a steep premium over the conventional alternative without offering any tangible benefits in two-wheel drive form. You can get exactly the same engine in the Mazda 6 Tourer 2.2d 150hp Sport Nav – albeit offering stronger performance and better claimed fuel economy due to the lighter, more streamlined body – plus a more practical boot and better drive. Despite this, it’s the 6 Tourer that is the better value car – to the tune of £64 per month. 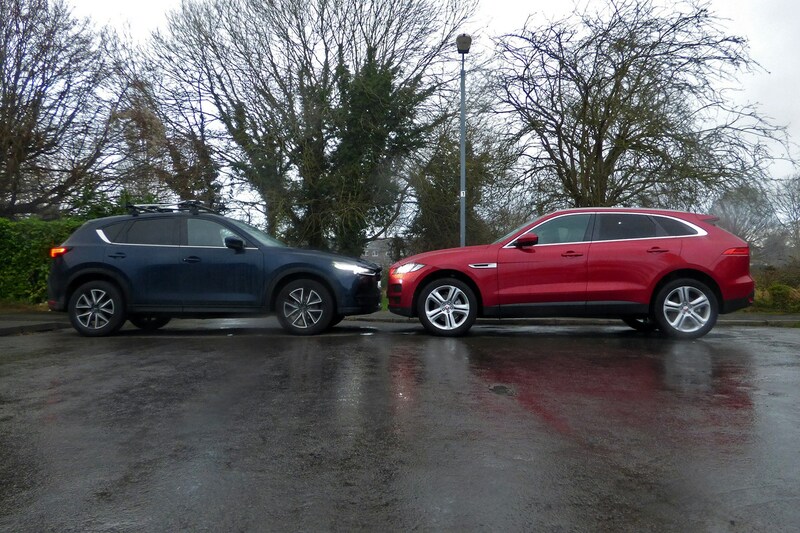 Yes, many drivers value the high driving position and butch looks of an SUV, but considering all the downsides associated with choosing the CX-5 over the 6 Tourer, we could never justify paying £407 per month for the CX-5 (36-month contract, £3,000 deposit and 10,000 mile-per-year allowance) compared with £343 for the 6 Tourer. With this in mind, the CX-5 is hard to recommend on a rational level. Should I finance a Mazda CX-5? 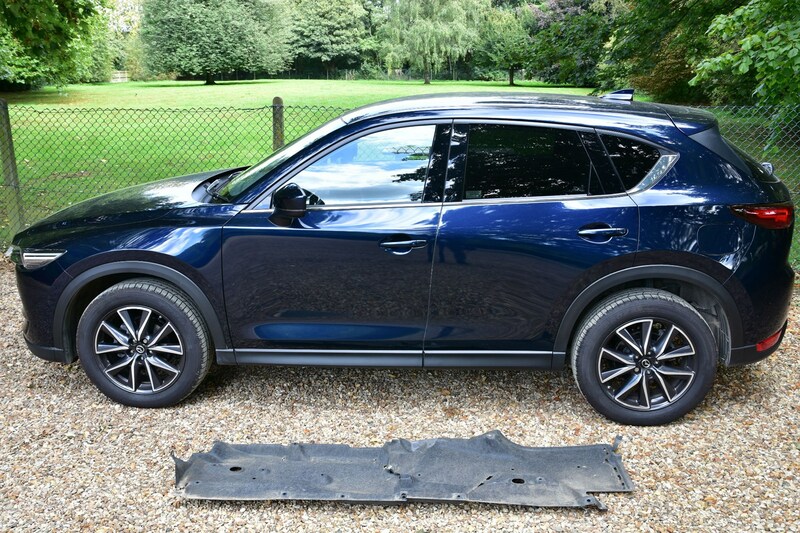 When we picked up the CX-5 in June 2017 it weighed in at £28,695 – £29,255 with metallic paint – and £466 per month on PCP finance (36-month contract, £3,000 deposit and 10,000-mile-per-year allowance). Since then, cash prices have risen to £29,095 – £29,695 with metallic paint – though finance prices have tumbled to a more affordable £407 per month (same contract details as above). Go for SE-L Nav trim, meanwhile, and that cost falls to £352 per month. This means that while the CX-5 is not the cheapest SUV of this size, it is still reasonable value – especially as our car is packed with so much standard kit. 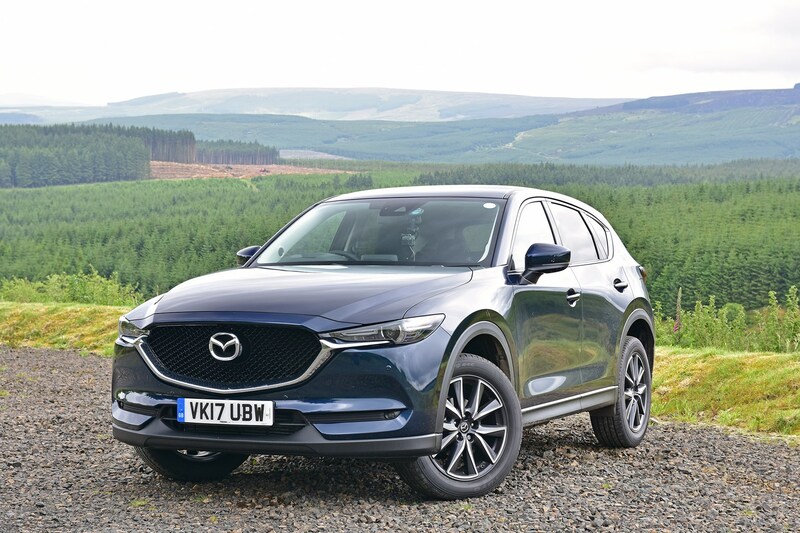 Interest charges are reasonably low with 3.9% APR, while a £1,250 deposit contribution discount reduces the amount of interest you pay, so if you want a CX-5, going for Mazda’s PCP offer is a wise move. 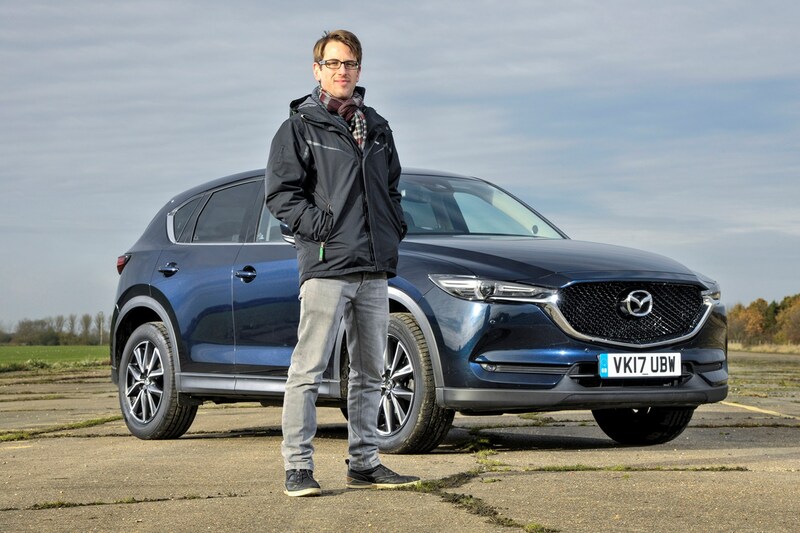 While other CX-5s that we’ve driven handled corners very well, while offering good comfort, our model has disconcertingly little grip around bends, especially in the wet, brakes that don’t pull the car up very sharply and mediocre traction – we wonder if shoddy tyres on our model are to blame for all of this. These factors have really eroded my confidence in our CX-5 causing me to seek out other long-termers to drive when possible. No one expects an SUV to drive like a sports car, but grip levels with our test Mazda are not up to scratch. We were, however, very impressed with the roadholding of the all-wheel drive 175hp diesel model we drove previously, so we believe the issue is specific to our car. How does the Mazda CX-5 compare against rivals? The Skoda Kodiaq offers tough competition, though a less well-equipped model would currently cost you £428 per month (same terms as above) compared with £407 for the Mazda, albeit with a standard-fit automatic gearbox. Furthermore, the Skoda’s engine is far rougher than the Mazda’s and offers a narrower spread of power. A similar Volkswagen Tiguan, on the other hand, comes in at £433 per month. 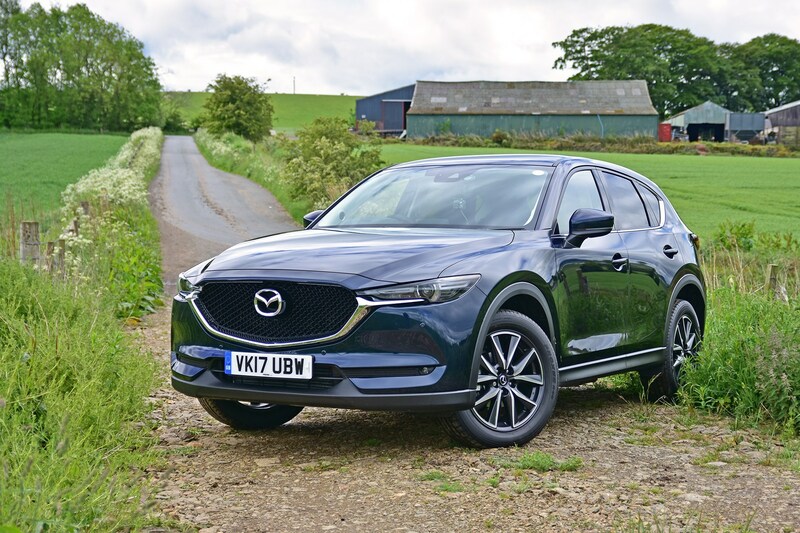 Despite sharing its engine with the Kodiaq, it feels admirably refined and has a more luxurious feeling cabin than the Mazda, meaning that many drivers will choose to spend a little more on the German car. Meanwhile, our CX-5 trounced a similar diesel Nissan X-Trail we drove previously, which was scandalously expensive in comparison, had a much cheaper feeling interior and a coarse diesel engine with much less muscle. Affordable alternatives include the popular Ford Kuga and Kia Sportage, though the Ford feels old and bland in comparison, and the Sportage can’t match the Mazda’s fantastic diesel engine or slick gearbox, and lacks power unless you go for a pricey model. 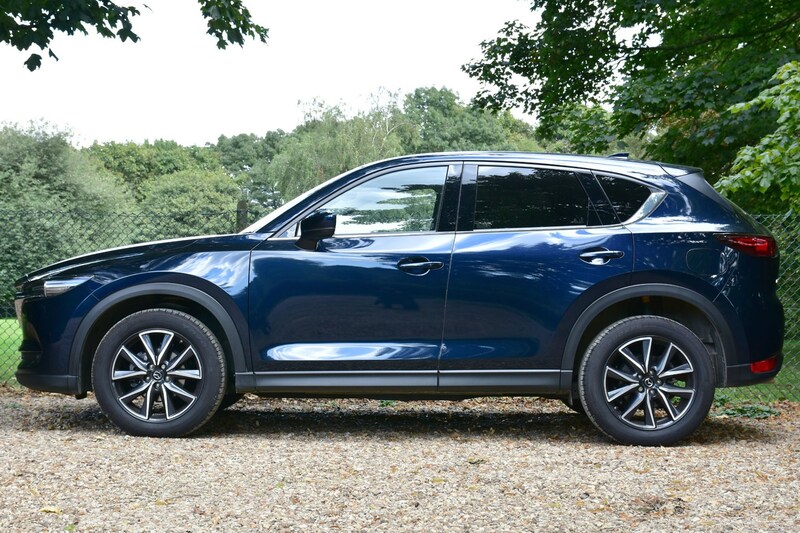 In short, the CX-5 isn’t the most desirable SUV or the cheapest, but if you value having tonnes of standard kit, its unusual looks and great engine and gearbox, it’s a strong choice in this class. With a reversing camera, heated front seats and steering wheel, a head-up display, Bose speakers and electric leather seats to name a few, our CX-5 has a huge amount of kit for the money. Considering the only option on our car is metallic paint, everything you see in our test car comes as standard. We’d happily save ourselves £55 per month and go for the SE-L Nav, since it’s only really the reversing camera that we’d miss from the Sport Nav version. Do that and the CX-5 seems better value compared with rivals that typically offer less kit for the same cost. Claimed fuel economy of 56.5mpg is par for the course for a two-wheel drive SUV of this size, though it’s way down on what the equivalent Mazda 6 Tourer with the same engine returns – 64.2mpg. 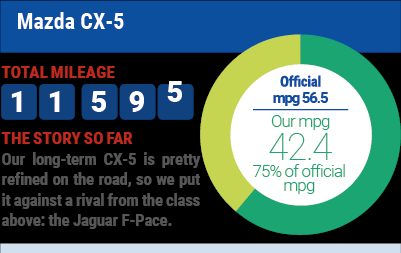 As with most new cars, it’s very hard to match the official economy figure for our CX-5 in reality. Our most economical tank came in at 49.3mpg (whatever the optimistic trip computer display shows below) – OK for a car of this size, thought it took very gentle driving to achieve this. Though we made a concerted effort at times to focus on driving economically, we never got any closer to the official figure and the car seems to naturally return around 43mpg – not bad in the realm of SUVs, but not great for something with two-wheel drive and no off-road credentials. With more high-speed motorway driving we saw that figure fall to as little as 36.5mpg. The CX-5’s bluff shape and hefty weight no doubt hinder it in the economy stakes compared with other types of family car, such as estates and more streamlined people carriers. After nearly a year on the Parkers fleet, the CX-5 has caused different responses across the Parkers team, with plenty of praise for the diesel engine and criticism for some elements of how it drives. Likes: Styling is such a subjective, emotive topic, but for me the CX-5 looks great. Some cars look atrocious with a gaping front grille flanked by slender headlamps, but here it looks purposeful, borderline aggressive. While much of its driving dynamics don’t particularly set it apart, the gearchange is deliciously slick, with a positive, short throw that puts many sportier cars to shame. Dislikes: Although I’m a fan of how it looks, the drab range of colours (Soul Red aside), do little to showcase the CX-5’s lines. Similarly, the interior looks dull compared with the exterior styling. Nicely made, but lacking in flair. 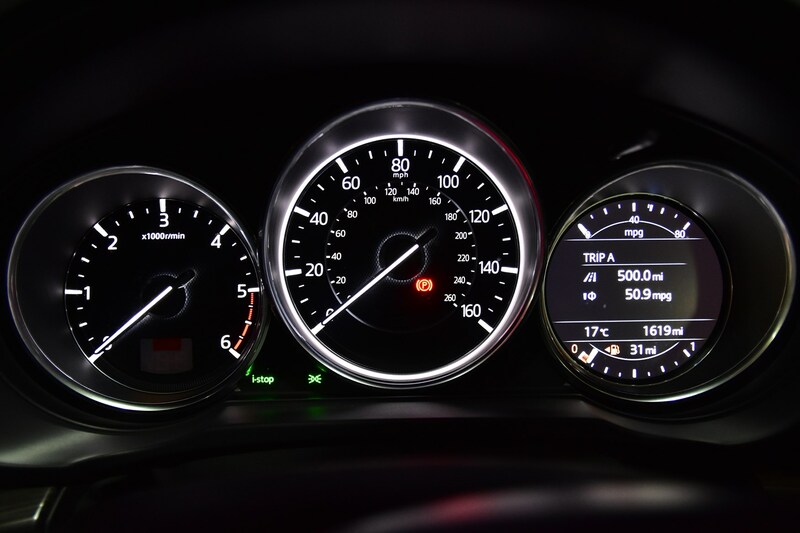 My perennial Mazda gripe is the multimedia system – I’m never sure what it is, but I never find it intuitive and end up getting frustrated that it’s not as logical (for my brain) to work its way around as say BMW, Mercedes or Volkswagen Group systems. Would I buy one? It’d certainly be a contender, although I prefer the similarly sized Volvo XC60. Ultimately, monthly cost would dictate it. Likes: Comfortable seats, surprisingly spacious interior with simple, classy dash design and lots of standard kit. Dislikes: Doesn't drive as well as expected, short first gear, painfully slow electric tailgate that doesn't quite open high enough. Would I buy one? No - If you must have an SUV, the Peugeot 3008 is more interesting, while the SEAT Ateca is better to drive. 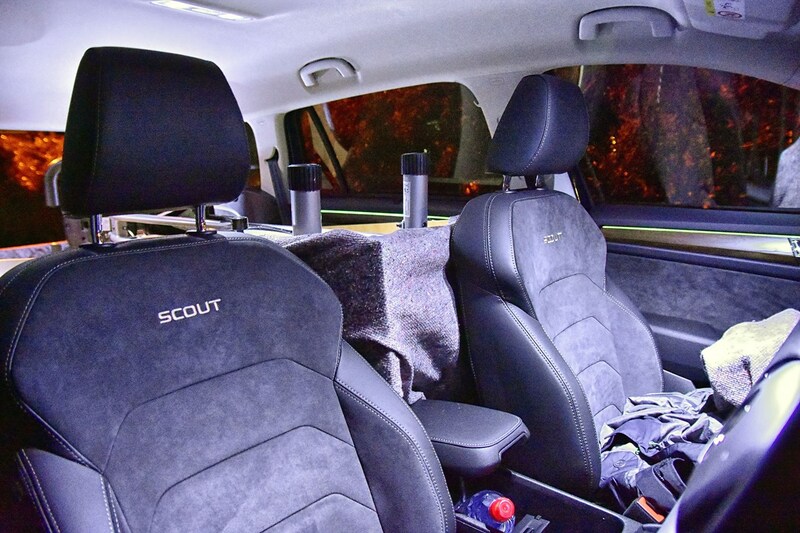 Alternatively, get a Skoda Octavia Scout for more space and genuine light off-road ability. Likes: Refinement is very good, with a well-muted diesel engine – with more than adequate power – that doesn’t become vocal at any point. Dislikes: The steering is too light on twisty roads to be confident about traction levels - especially in the wet – and the tyres themselves don’t generate much grip. Would I buy one? Yes – if I wanted an SUV, but I’d rather have an estate car. Likes: An initially rather bland package, the CX-5 has a couple of nice touches; the head up display is clear and has a wide range of viewing angles, and the hardware controls for the multimedia system are very intuitive even if the software itself is a little dated. Perhaps the CX-5 in this form - front-wheel drive and 150hp - is more of a tall hatchback, but it drives well. With some heat in the tyres, it felt like it had more grip, too. Dislikes: Ultimately, it's just not that memorable. In about 400 miles of driving, on and off, the CX-5 didn't make much of an impression either way. Would I buy one? No, I'd prefer something with more character, and 4x4 - even a Dacia Duster's simplicity offers more to engage with. 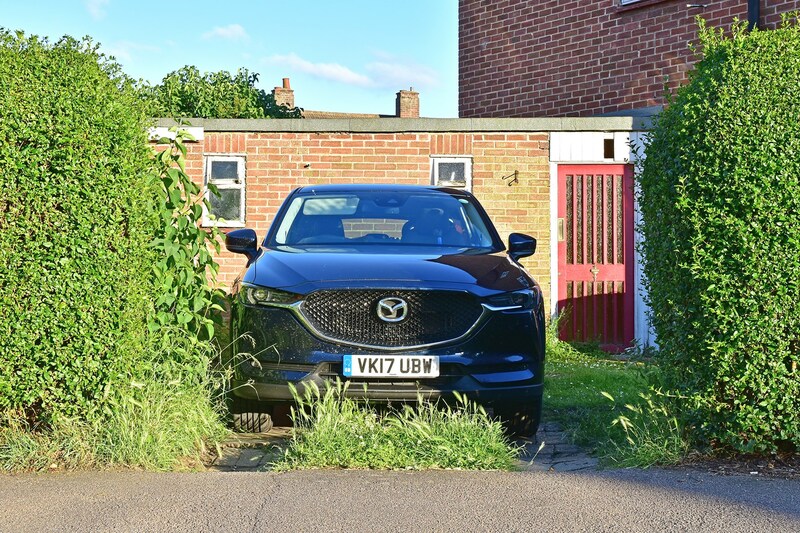 The CX-5 is a good SUV in many senses, but as with most off-roaders it’s expensive and unnecessarily flawed compared with the direct estate car alternative it's based on, making it very hard to justify. This is all the more so since our car is two-wheel drive and has no off-road pretensions – meaning that the benefits of its SUV format extend no further than a slightly higher driving position and boxy design. If you have to have an off-roader and value having the most kit for your money, reasonable practicality and a punchy diesel engine, the CX-5 is a worthy choice. We just feel there are too many sacrifices needed when the Mazda 6 Tourer offers a similar amount of kit for less money, a bigger boot and the same diesel engine provides greater performance and economy. Throw in our concerns with how our specific model drives – limited grip and braking power – and we’d choose the 6 Tourer every day of the week.